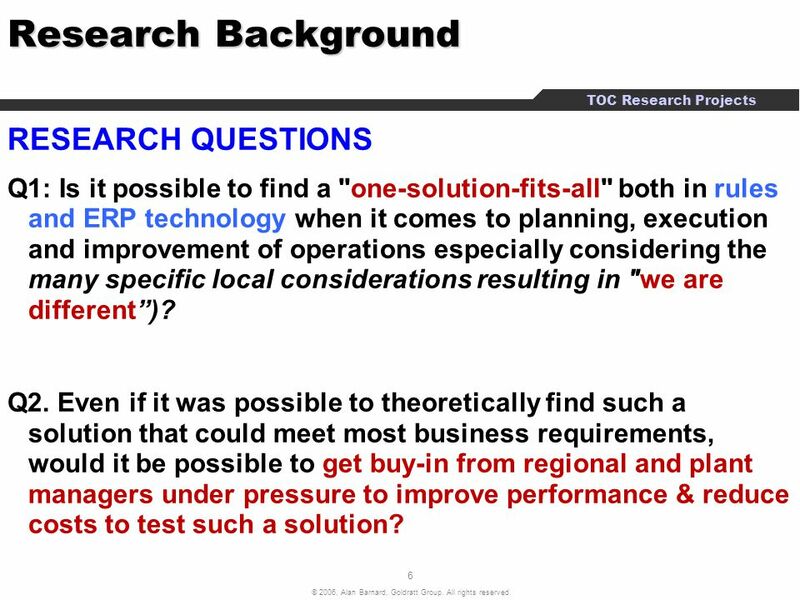 Q1: Is it possible to find a "one-solution-fits-all" both in rules and ERP technology when it comes to planning, execution and improvement of operations especially considering the many specific local considerations resulting in "we are different”)? Q2. 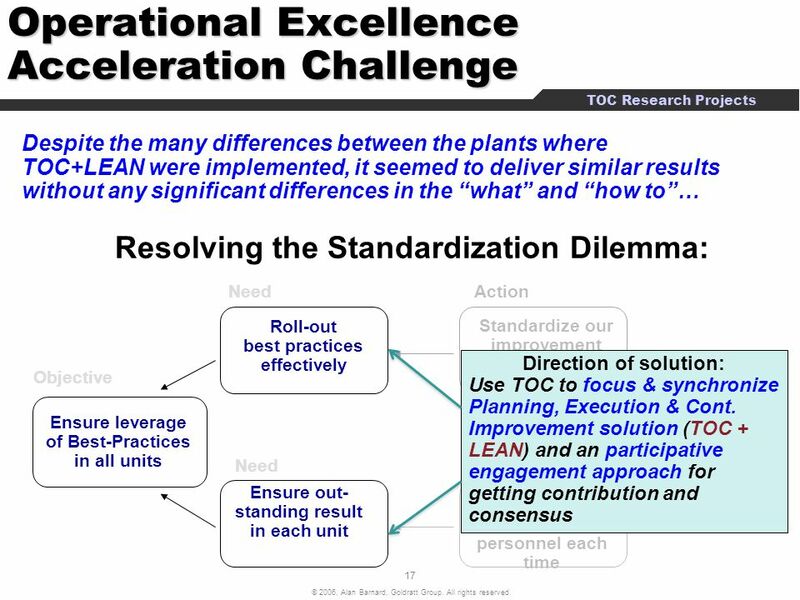 Even if it was possible to theoretically find such a solution that could meet most business requirements, would it be possible to get buy-in from regional and plant managers under pressure to improve performance & reduce costs to test such a solution? 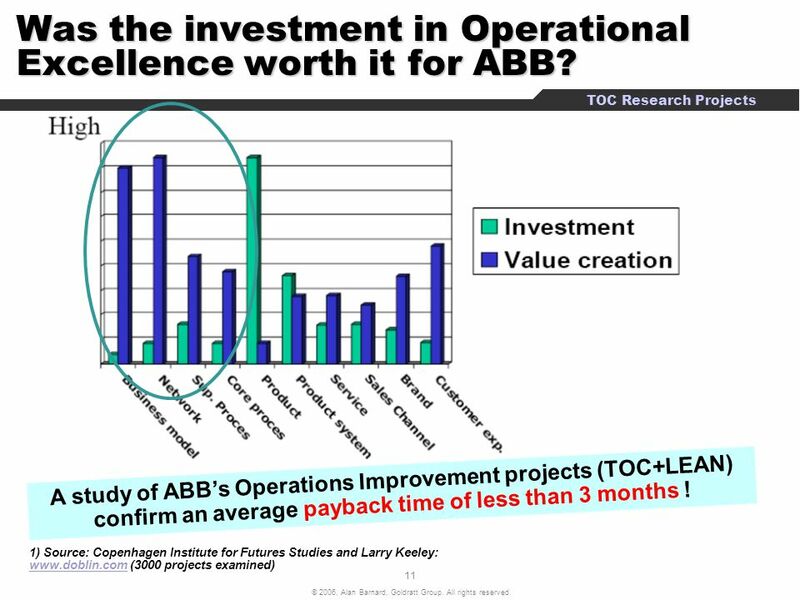 11 Was the investment in Operational Excellence worth it for ABB? 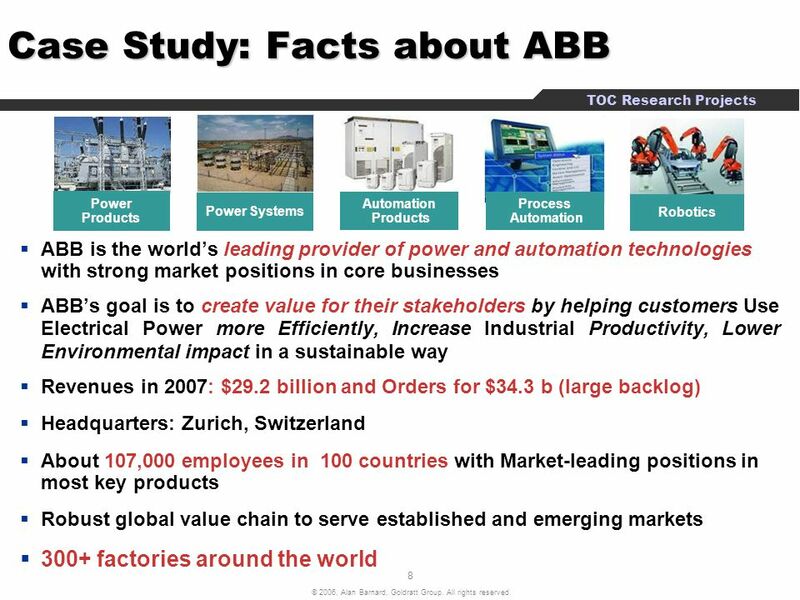 What blocks a company such as ABB from identifying and spreading best-practices, learnings and results effectively in a big organization? 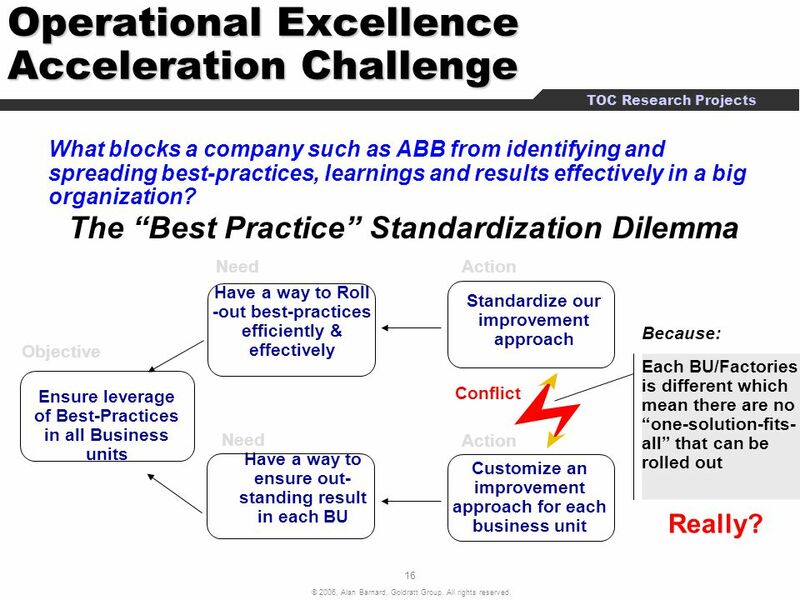 The “Best Practice” Standardization Dilemma Need Have a way to Roll -out best-practices efficiently & effectively Action Standardize our improvement approach Each BU/Factories is different which mean there are no “one-solution-fits-all” that can be rolled out Because: Conflict Objective Ensure leverage of Best-Practices in all Business units Need Have a way to ensure out- standing result in each BU Action Customize an improvement approach for each business unit Really? …. 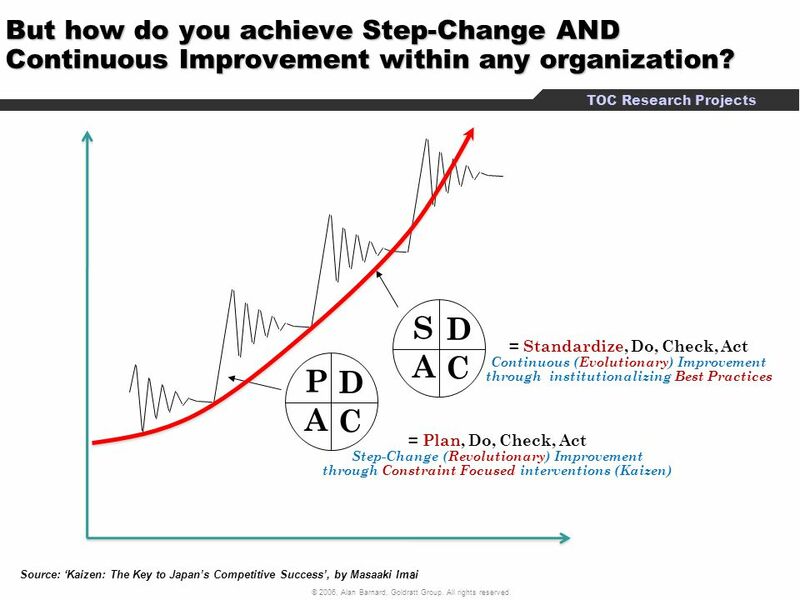 addressing resistance to change as an organizational constraint: Project scope definition Execution Plan Final solution agreement Hand - over Pilot results Close project Validate Start Agreement 2 3 4 5 1 6 7 Development Piloting Implementation Analysis Planning Sustain 6. Agreement by all collaborators including management that we can move forward with confidence 4. Agreement that no disastrous side effects will result 5. Agreement on the implementation requirements and the plan itself 3. Agreement that the solution will yield the desired results 2. Agreement on the direction of the solution 1. 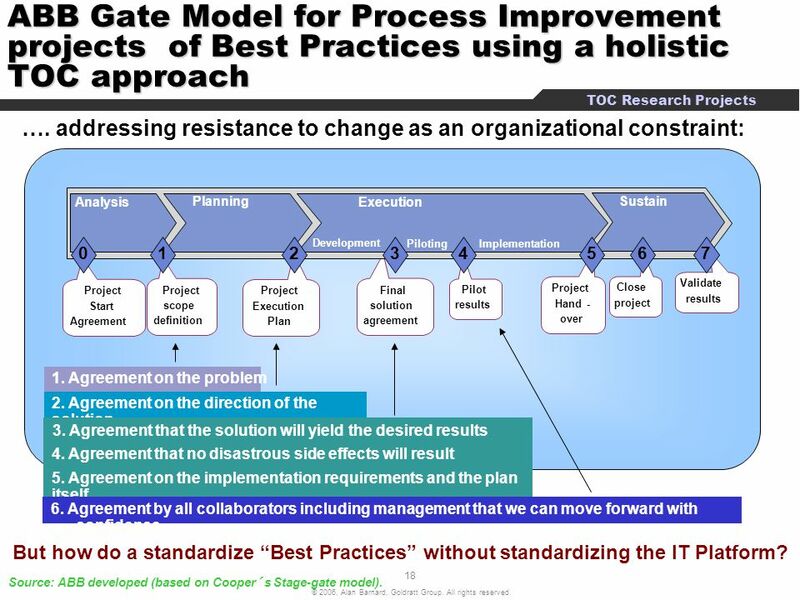 Agreement on the problem But how do a standardize “Best Practices” without standardizing the IT Platform? 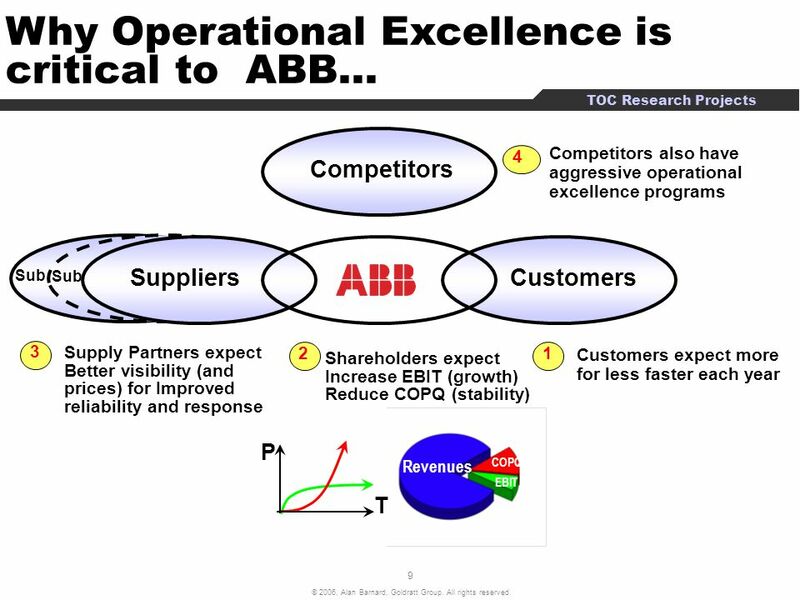 Source: ABB developed (based on Cooper´s Stage-gate model). 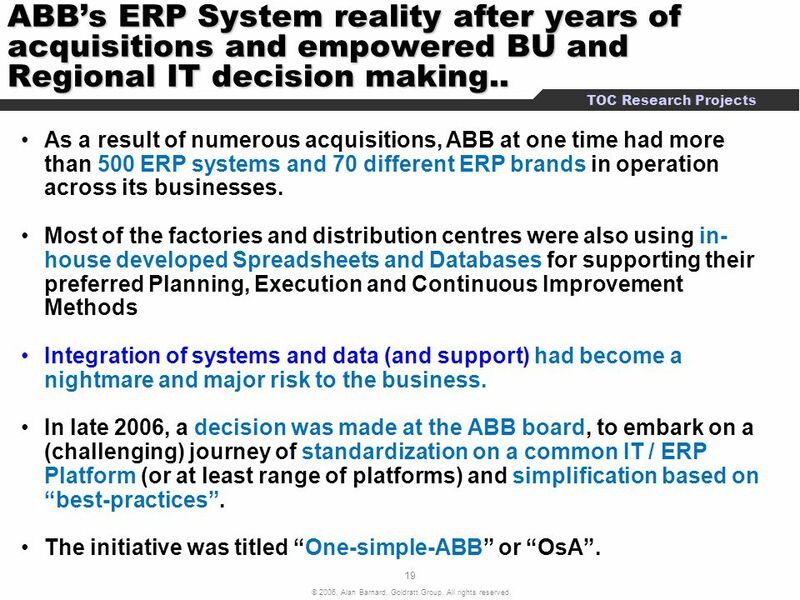 19 ABB’s ERP System reality after years of acquisitions and empowered BU and Regional IT decision making.. As a result of numerous acquisitions, ABB at one time had more than 500 ERP systems and 70 different ERP brands in operation across its businesses. 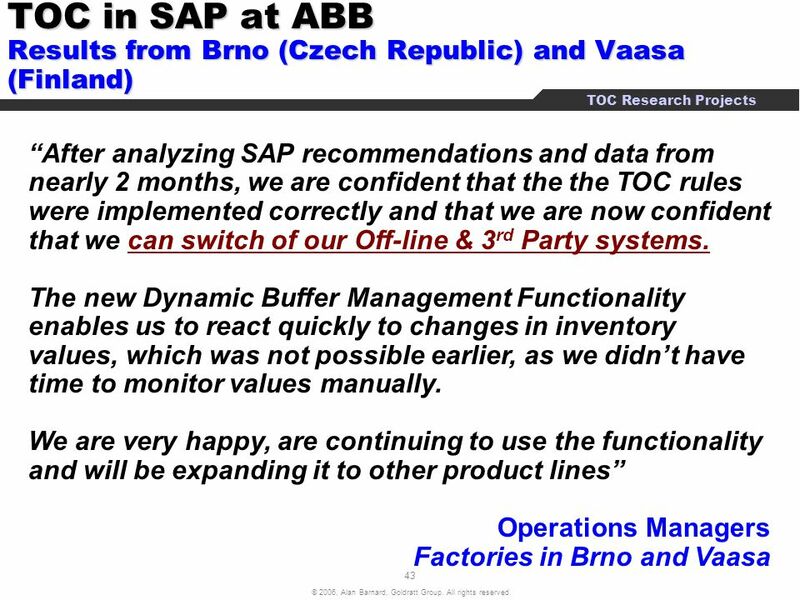 Most of the factories and distribution centres were also using in-house developed Spreadsheets and Databases for supporting their preferred Planning, Execution and Continuous Improvement Methods Integration of systems and data (and support) had become a nightmare and major risk to the business. In late 2006, a decision was made at the ABB board, to embark on a (challenging) journey of standardization on a common IT / ERP Platform (or at least range of platforms) and simplification based on “best-practices”. 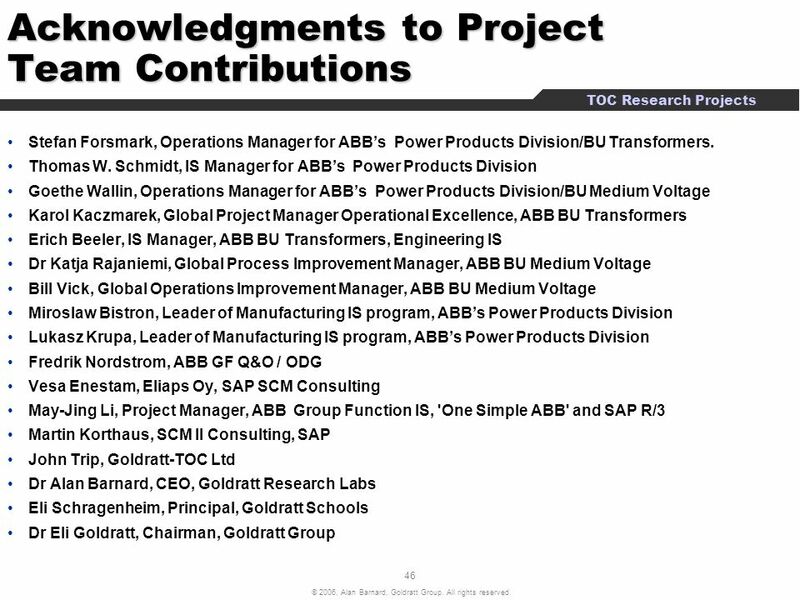 The initiative was titled “One-simple-ABB” or “OsA”. 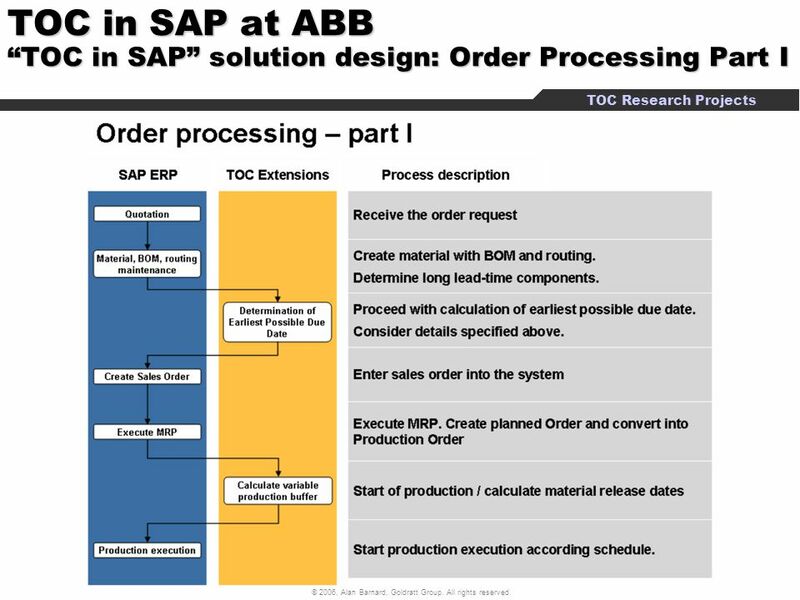 Press Release in March 2007 “Today, ABB signed a strategic agreement with the German-based ERP provider, SAP to help deploy common SAP ERP software through its global operations to help unify and simplify some of ABB’s most important business processes. 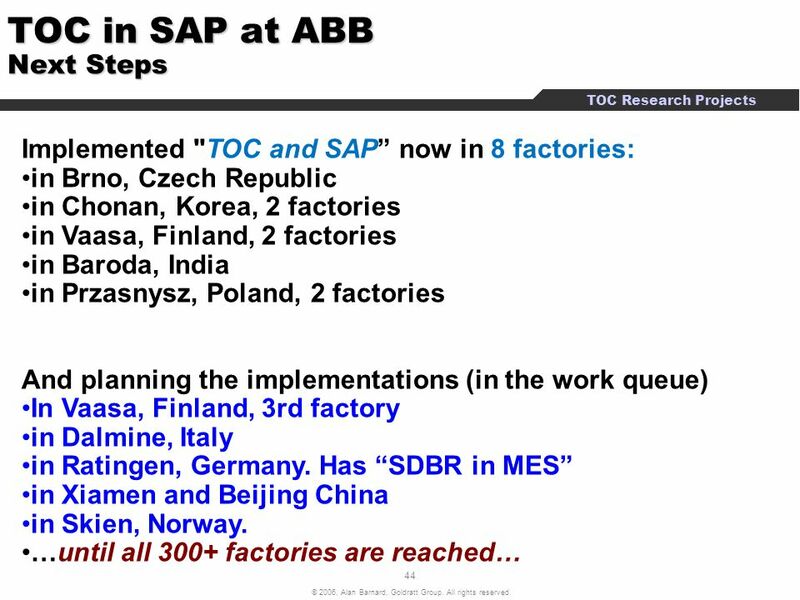 The OsA initial target is one ERP per country, and ultimately one ERP platform per region for all of ABB that would enable a high degree of standardization in the human resources, finance and administration and corporate governance functions as well as in the operational excellence “best-practices” Yes, BUT.... Would it really be possible to find and get agreement that a “One-simple-ABB” solution was possible for managing the diversity and complexity of ABB’s 300+ factories? 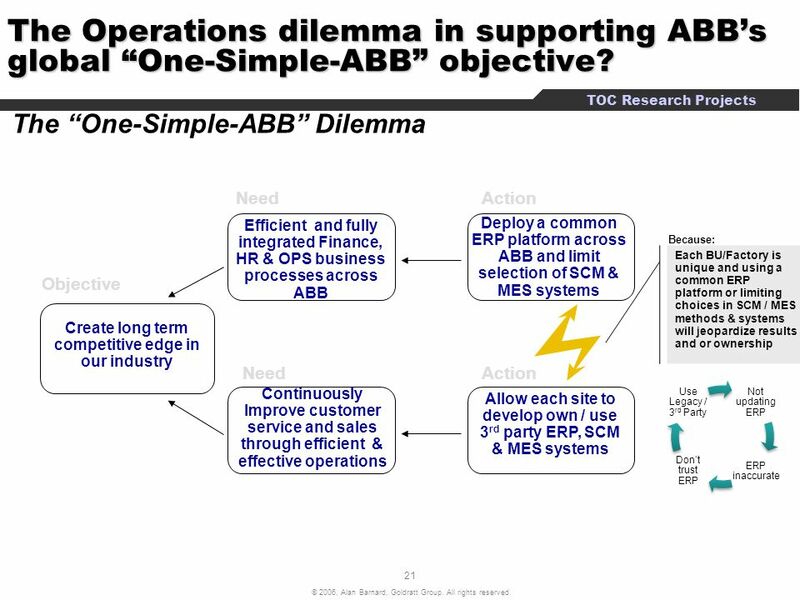 21 The Operations dilemma in supporting ABB’s global “One-Simple-ABB” objective? 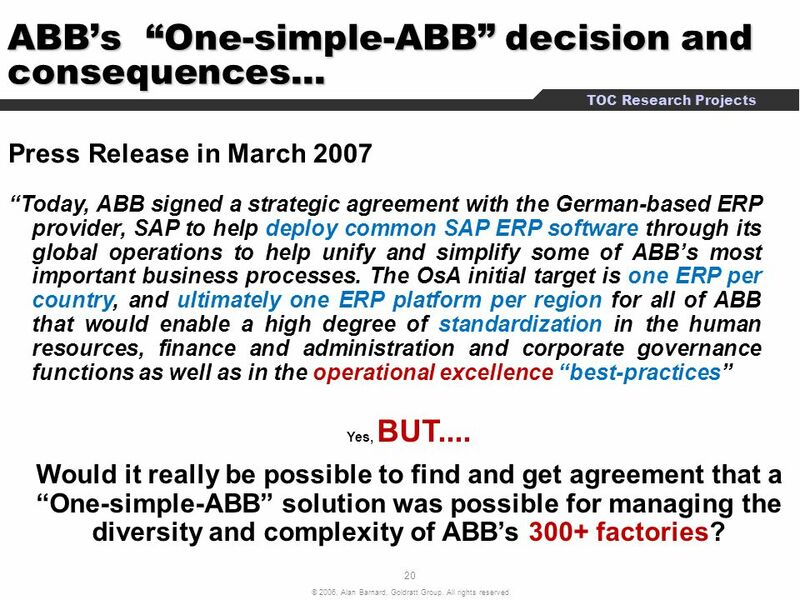 22 The Operations dilemma in supporting ABB’s global “One-Simple-ABB” objective? 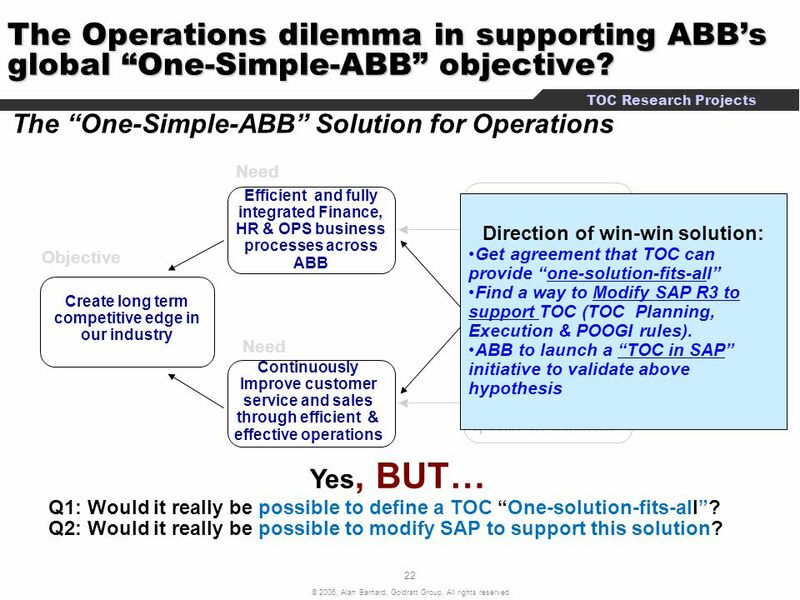 The “One-Simple-ABB” Solution for Operations Need Efficient and fully integrated Finance, HR & OPS business processes across ABB Direction of win-win solution: Get agreement that TOC can provide “one-solution-fits-all” Find a way to Modify SAP R3 to support TOC (TOC Planning, Execution & POOGI rules). 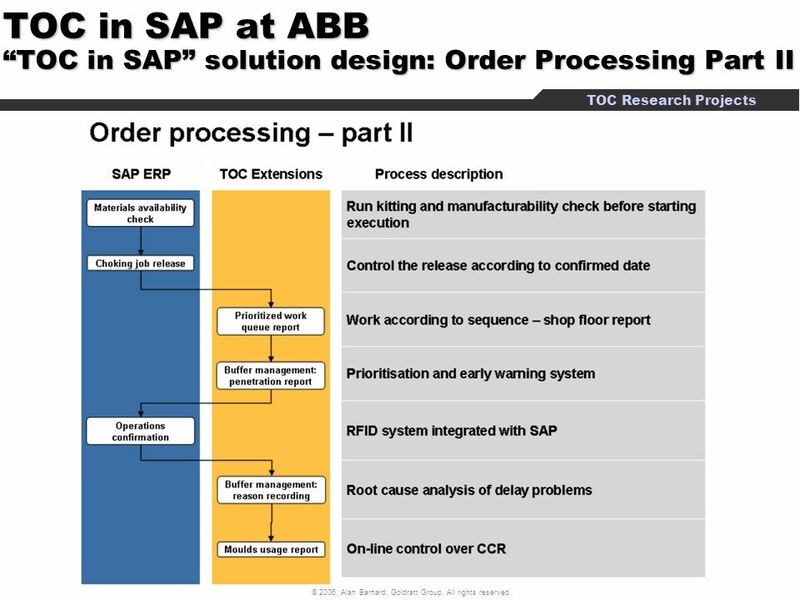 ABB to launch a “TOC in SAP” initiative to validate above hypothesis Objective Create long term competitive edge in our industry Need Action Continuously Improve customer service and sales through efficient & effective operations Yes, BUT… Q1: Would it really be possible to define a TOC “One-solution-fits-all”? 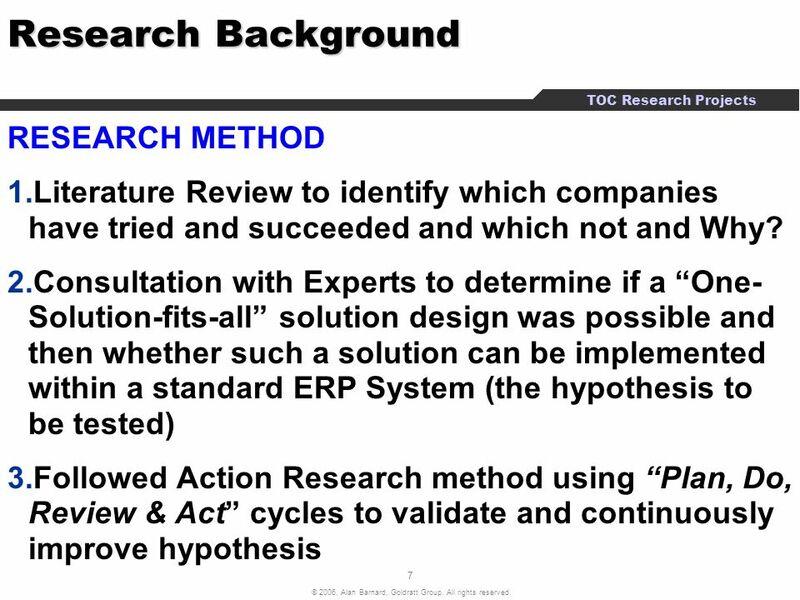 Q2: Would it really be possible to modify SAP to support this solution? 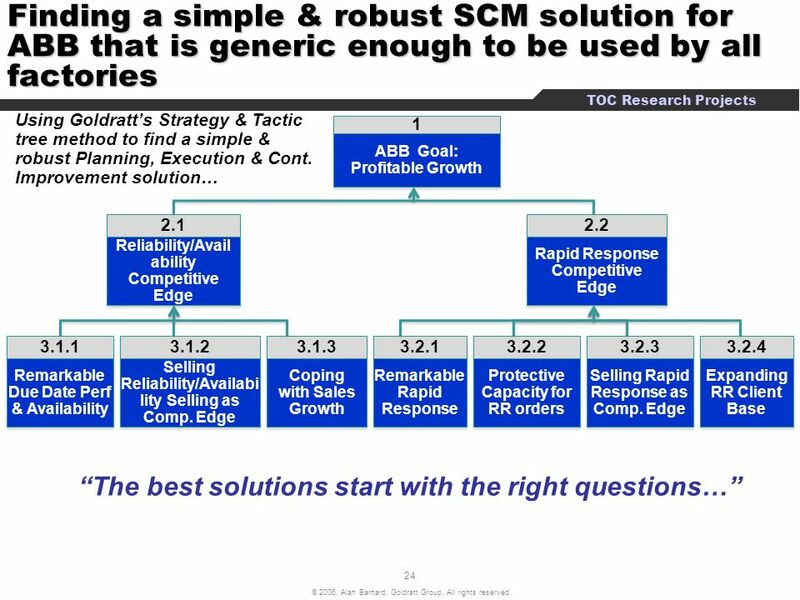 1 ABB Goal: Profitable Growth 2.1 Reliability/Availability Competitive Edge 2.2 Rapid Response Competitive Edge 3.1.1 Remarkable Due Date Perf & Availability 3.1.2 Selling Reliability/Availability Selling as Comp. 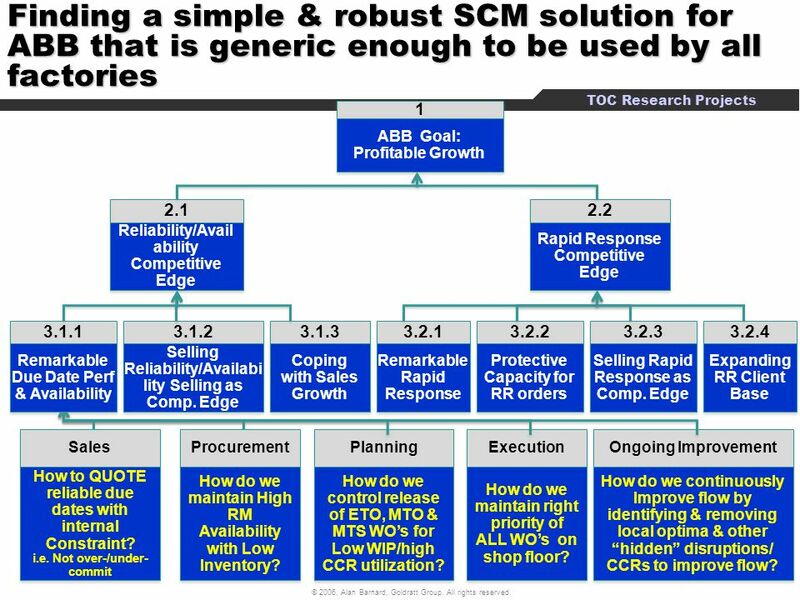 Edge 3.1.3 Coping with Sales Growth 3.2.1 Remarkable Rapid Response 3.2.2 Protective Capacity for RR orders 3.2.3 Selling Rapid Response as Comp. 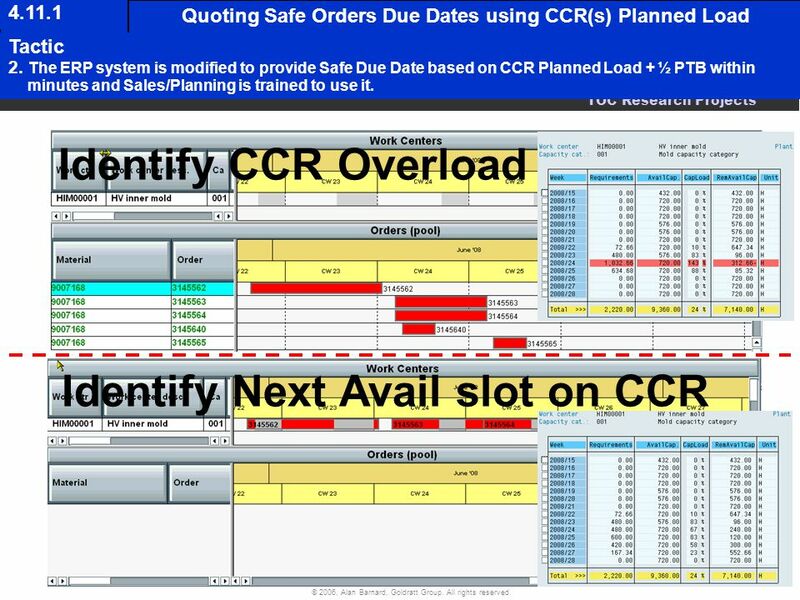 Edge 3.2.4 Expanding RR Client Base Sales How to QUOTE reliable due dates with internal Constraint? i.e. 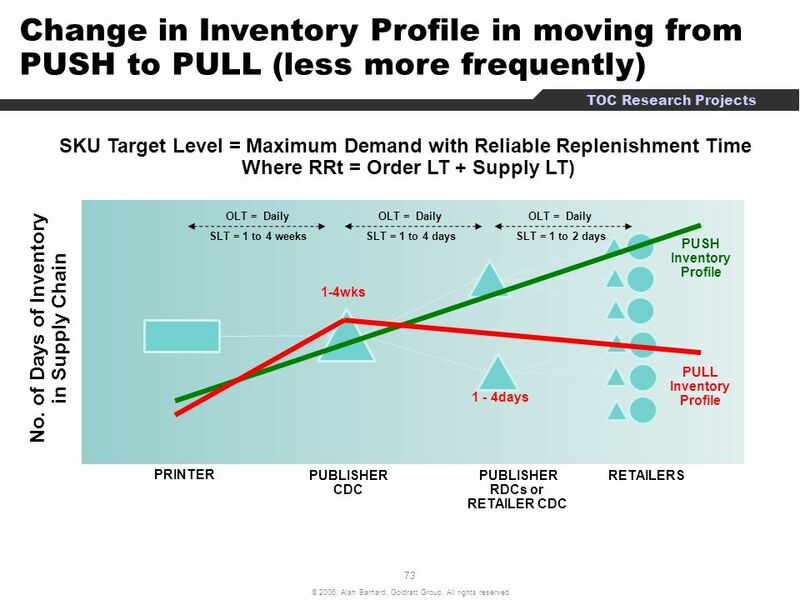 Not over-/under-commit Procurement How do we maintain High RM Availability with Low Inventory? 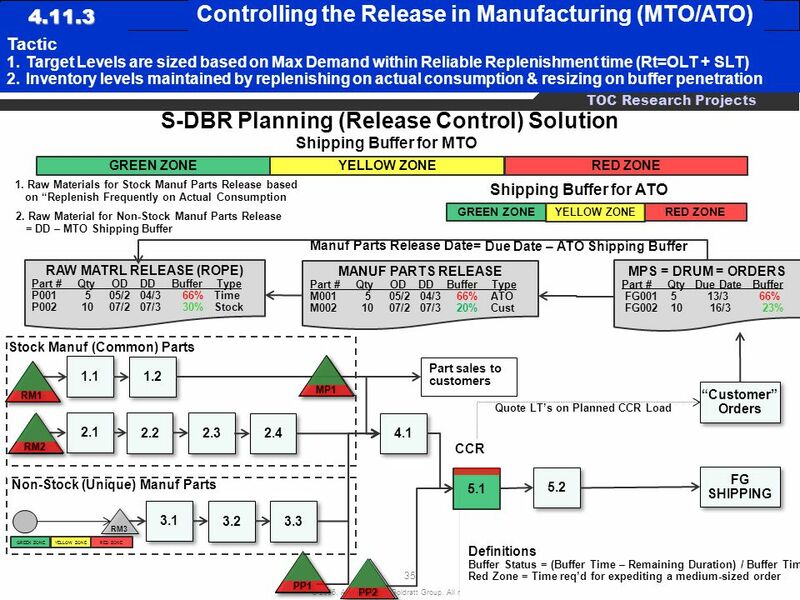 Planning How do we control release of ETO, MTO & MTS WO’s for Low WIP/high CCR utilization? Execution How do we maintain right priority of ALL WO’s on shop floor? 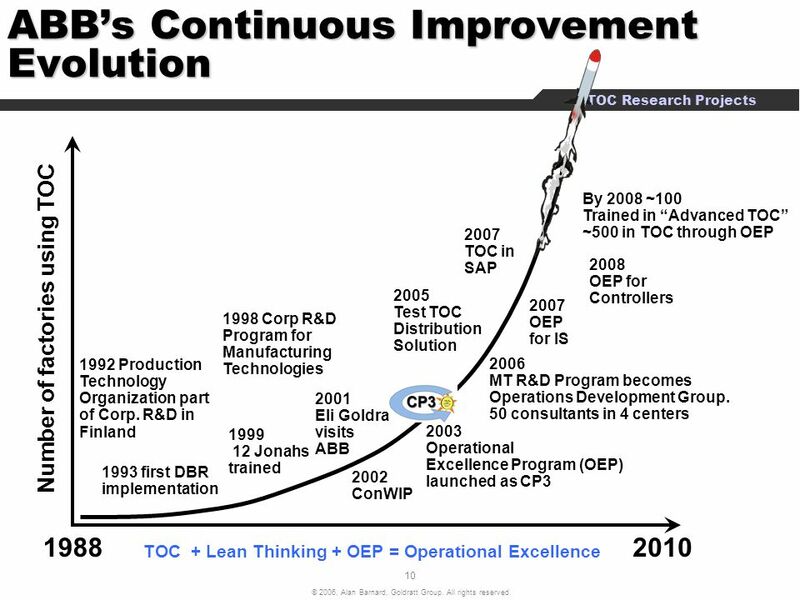 Ongoing Improvement How do we continuously Improve flow by identifying & removing local optima & other “hidden” disruptions/ CCRs to improve flow? 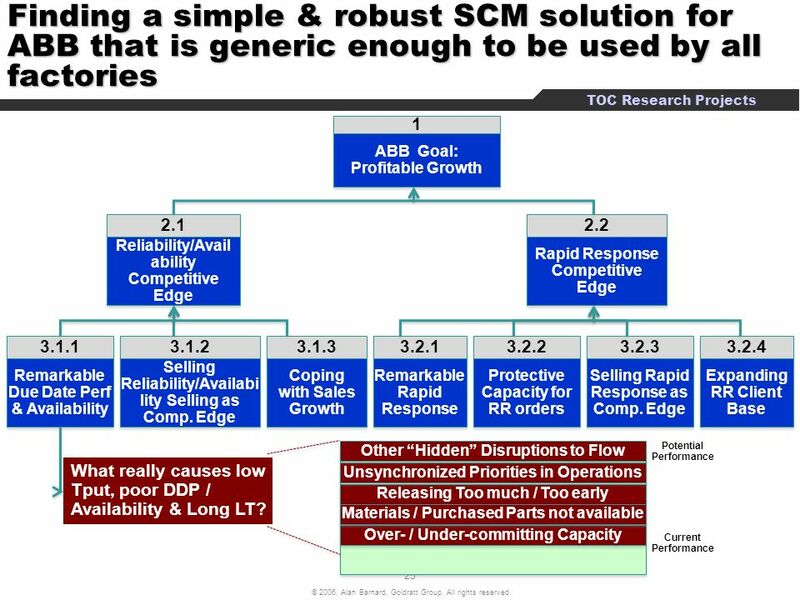 1 ABB Goal: Profitable Growth TOC’s PLANNED LOAD DETAILS Why is the change needed? Necessary Assumption What is the objective of the change? Strategy Why will the change achieve the objective? Parallel Assumptions How will the change be implemented? 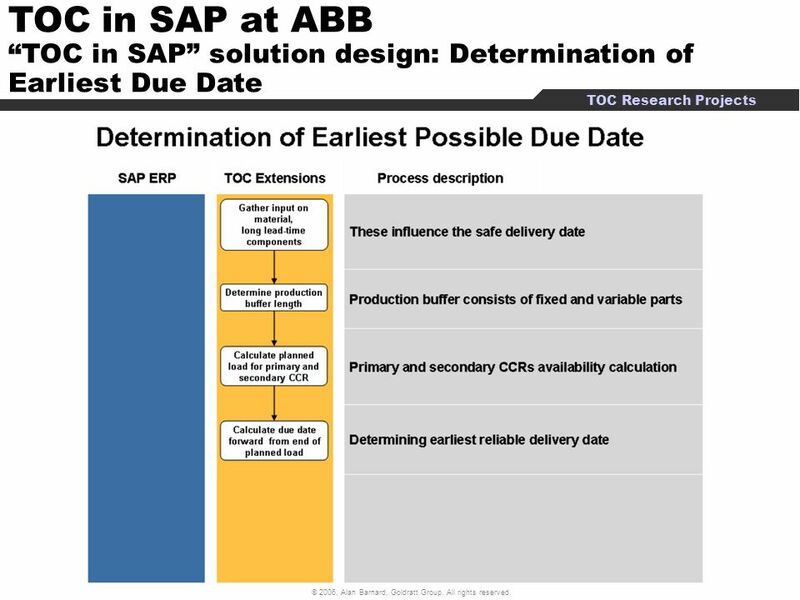 Tactic 4.11.1 Quoting Safe Due Dates using CCR(s) Planned Load 2.1 Reliability/Availability Competitive Edge When Sales/Planning accept an order due date which the factory cannot achieve, it jeopardize ABB’s Reliability CE. 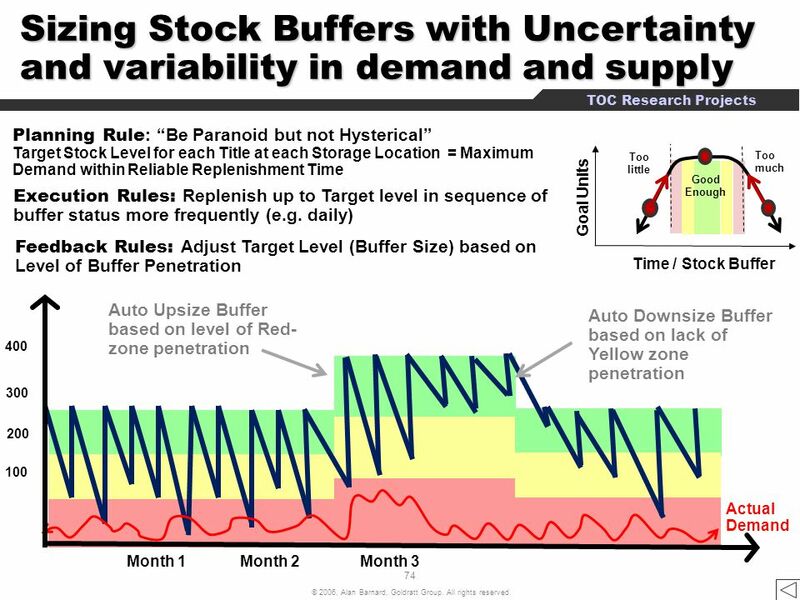 Even if the constraint is in the market, fluctuations in demand or supply can cause specific resources (CCRs) to be overloaded. Under such circumstances, quoting fixed lead times is very likely to result in missed due dates resulting in poor DDP. 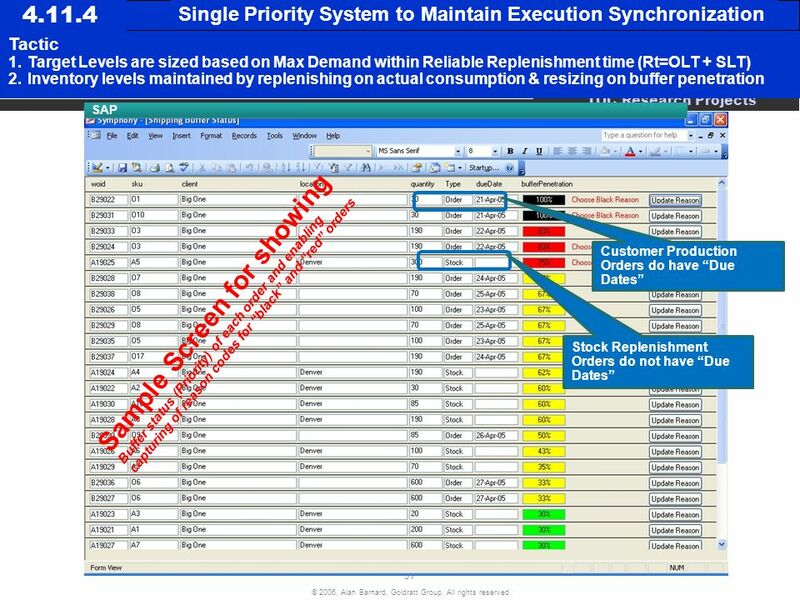 Due-dates given by the sales force/planning are (almost) always met even during periods of capacity overloads (Target: 99% DDP) 3.1.1 Remarkable Due Date Perf & Availability It is relatively easy to meet all due-dates when the commitments are given based on actual planned loads on the CCR(s) and S-DBR and BM are in place to control release & align priorities. 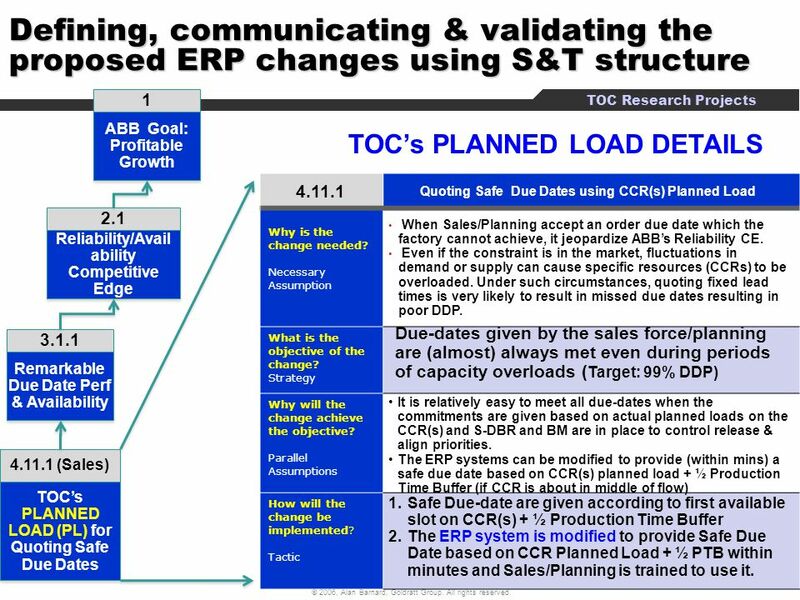 The ERP systems can be modified to provide (within mins) a safe due date based on CCR(s) planned load + ½ Production Time Buffer (if CCR is about in middle of flow) (Sales) TOC’s PLANNED LOAD (PL) for Quoting Safe Due Dates Safe Due-date are given according to first available slot on CCR(s) + ½ Production Time Buffer The ERP system is modified to provide Safe Due Date based on CCR Planned Load + ½ PTB within minutes and Sales/Planning is trained to use it. 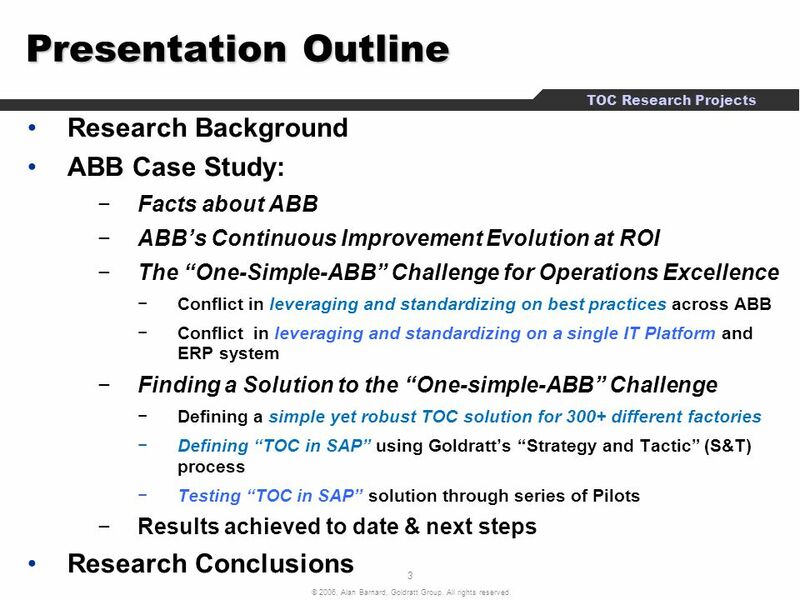 1 ABB Goal: Profitable Growth TOC RELEASE CONTOL (S-DBR) DETAILS Why is the change needed? Necessary Assumption What is the objective of the change? Strategy Why will the change achieve the objective? Parallel Assumptions How will the change be implemented? 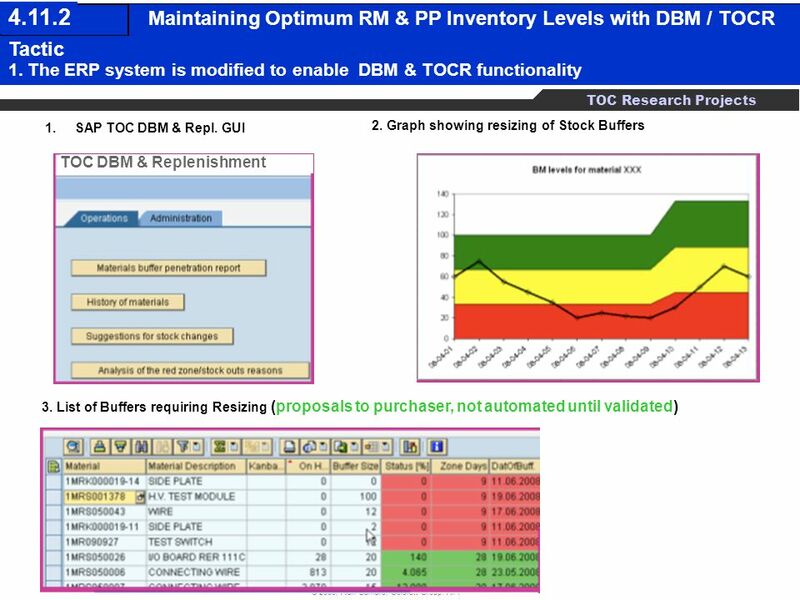 Tactic 4.11.3 TOC Release Control to prevent Over-production 2.1 Reliability/Availability Competitive Edge Having too many orders on the shop floor masks priorities, promotes local optima behavior and therefore prolongs the lead-time and significantly disrupts due-date-performance (DDP). 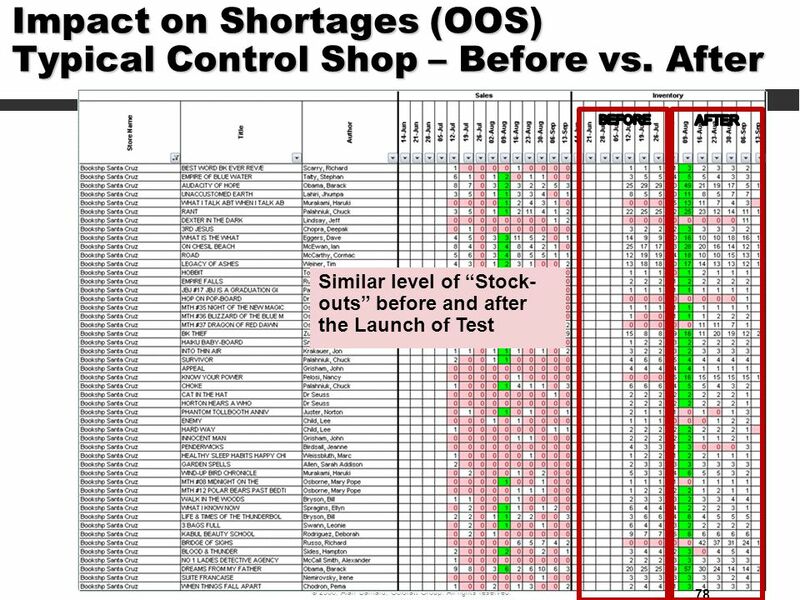 Having too little orders on the shop floor will cause starvation of CCRs and cause lost production and potentially missed due dates (jeopardizing building of a “Reliability” Comp. Edge) . The shop floor is populated ONLY with orders that have to be filled within a predefined horizon. 3.1.1 Remarkable Due Date Perf & Availability In traditionally run plants touch time is a very small fraction (<10%) of the lead time. 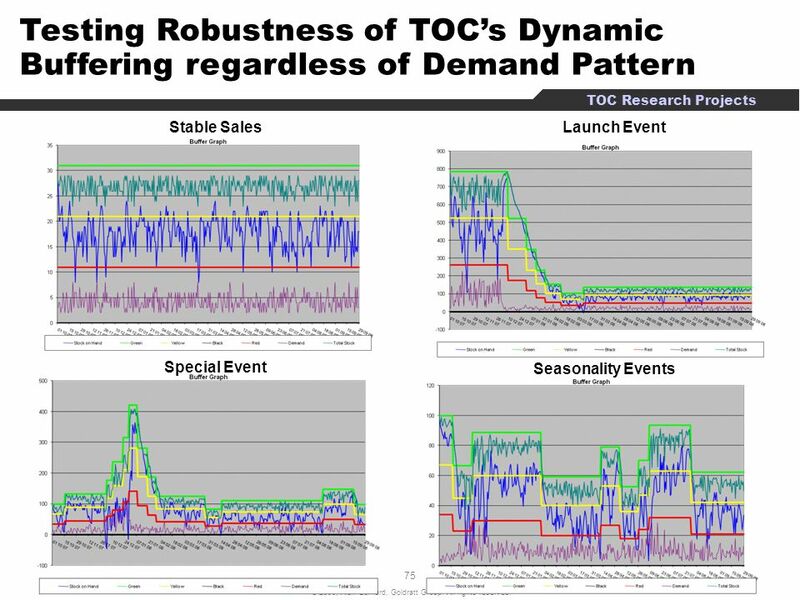 Vast experience shows that, in traditionally run plants, restricting the release of materials, to be just half the current lead time before the corresponding due date, leads only to good results and to no negative ramifications* (lead time shrinks to less than half, DDP improves considerably, throughput goes up and excess capacity is revealed). 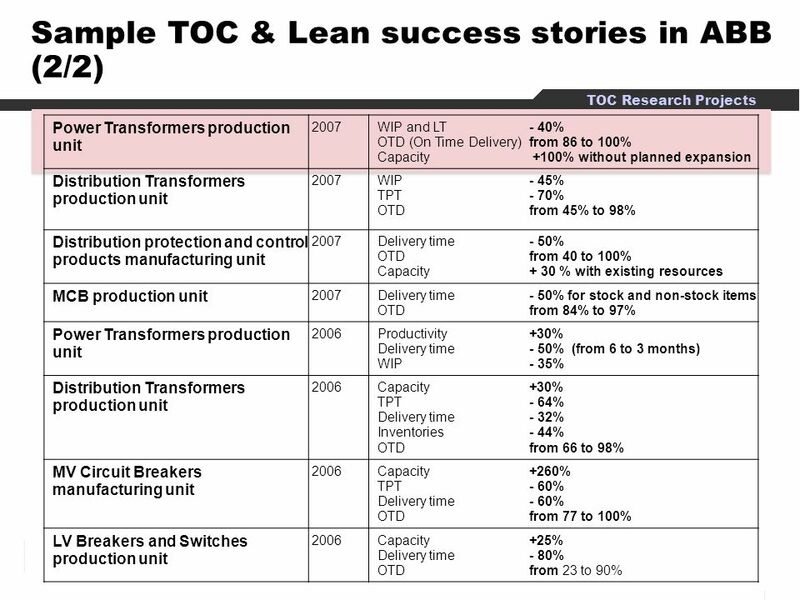 These results are achieved irrespective of whether or not a bottleneck exists. * Except for environments which are dominated by heavily dependent set-up matrixes. Those environments have to be dealt in a different way. 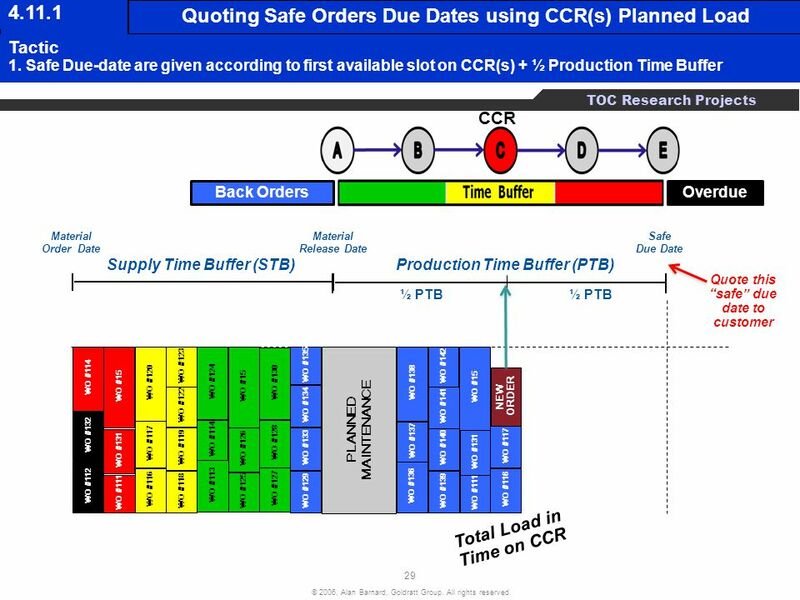 (Planning) TOC’s RELEASE CONTROL (S-DBR) to control WIP and improve T, DDP & LT For each group of products currently having similar lead times, a buffer time is set to be equal to 50% of the current avg lead-time. Orders are released to the floor only a buffer time before their committed due-date, and if all materials are available. (WIP frozen until its time arrives). The ERP system usage is modified to support S-DBR release control and automatic material availability check. 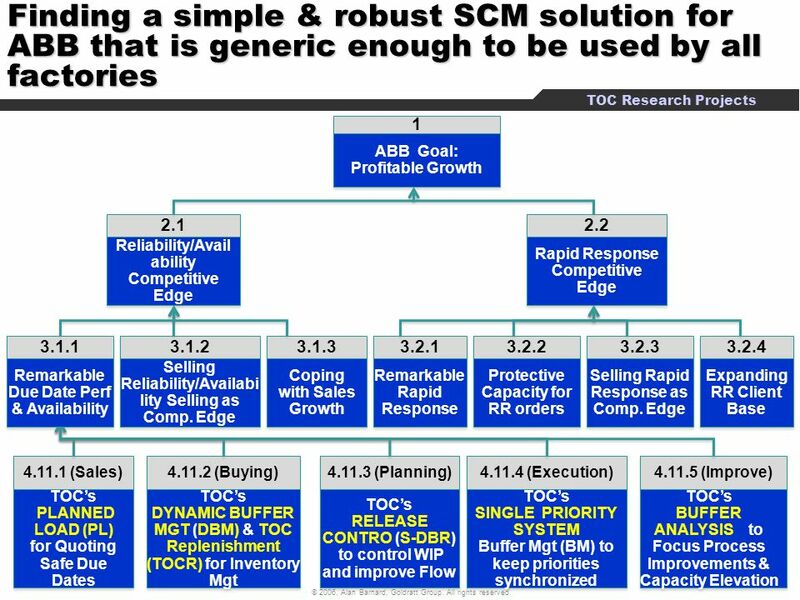 1 ABB Goal: Profitable Growth TOC BUFFER ANALYSIS (POOGI) DETAILS Why is the change needed? Necessary Assumption What is the objective of the change? Strategy Why will the change achieve the objective? Parallel Assumptions How will the change be implemented? 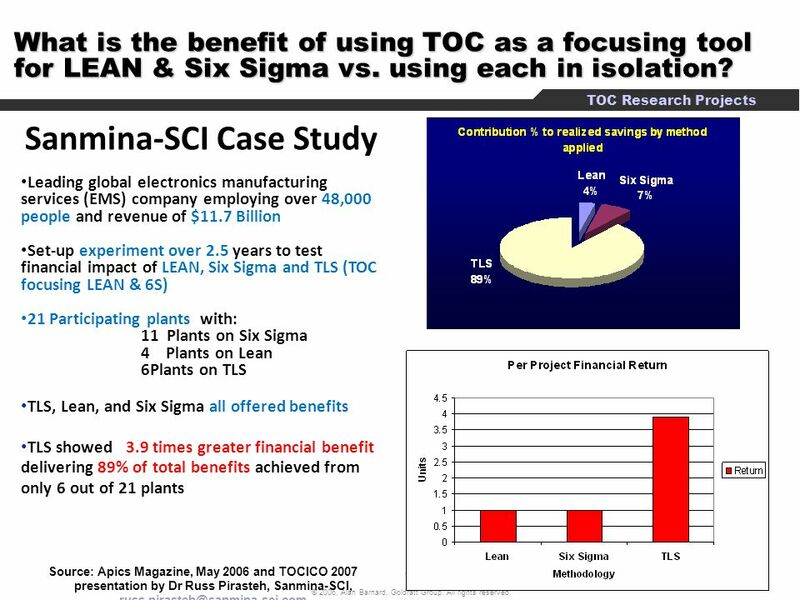 Tactic 4.11.5 Focusing Mechanism for Process Improvement/Elevation 2.1 Reliability/Availability Competitive Edge Most local improvement initiatives in manufacturing, which use good tools (Root Cause analysis, Lean and Six Sigma techniques) do improve the local performance but, many times, those local improvements do not translate into global improvements Not having sufficient protective capacity results in long LT & poor DDP All local improvements initiatives in manufacturing do contribute meaningfully to the global performance and there is enough protective capacity for high DDP 3.1.1 Remarkable Due Date Perf & Availability If a CCR exists, work-in-process piles up in front of it. When materials release is restricted, the only work centers that have work-in-process piling up in front of them are the real CCRs. 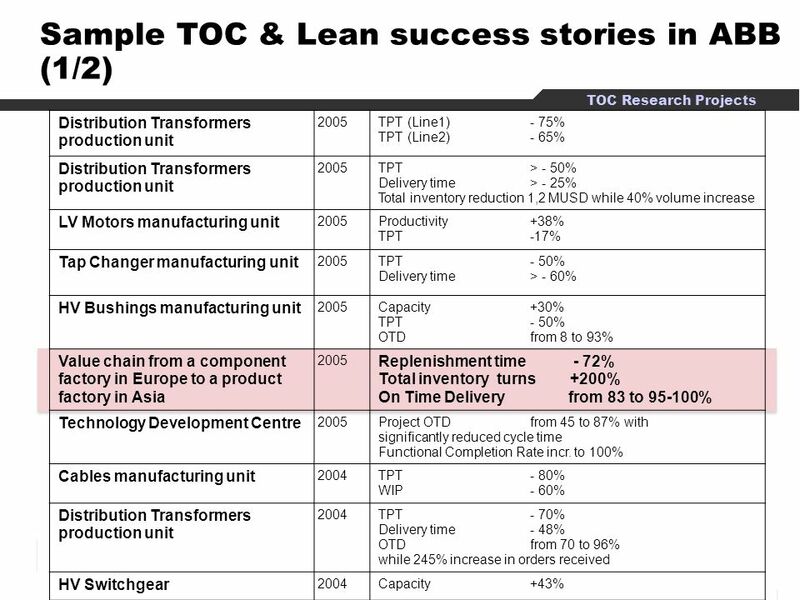 CCRs can be identified also by recording “what black & red orders were waiting for?” In most of the cases additional capacity can be exposed by better EXPLOITATION like: - Ensuring that CCRs do not take lunch or shift change breaks, - Offloading work from the CCRs to less “effective” work centers that have ample excess capacity, - Using LEAN /Six Sigma techniques to shrink the set-up time/reduce variation on the CCRs, - ELEVATING capacity with overtime or capex approval for the CCRs, etc. 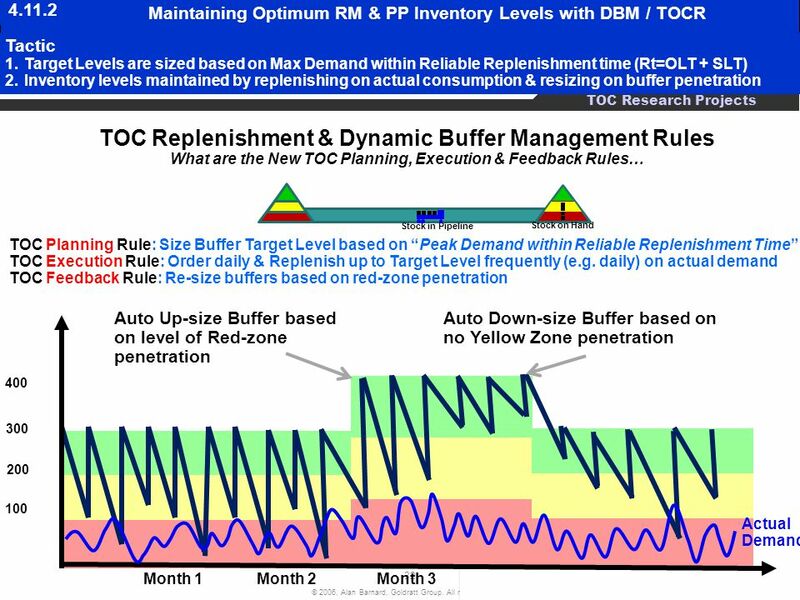 (Improve) TOC’s BUFFER ANALYSIS to Focus Improvements & Capacity Elevation For all Red & Black Orders and Stock Buffers, Production Supervisors/workers/purchasers record “what was black/red order waiting for?” CCRs are identified and effectively removed through focused process improvement / elevation to the extent that most loaded resource has at least 20% protective capacity. 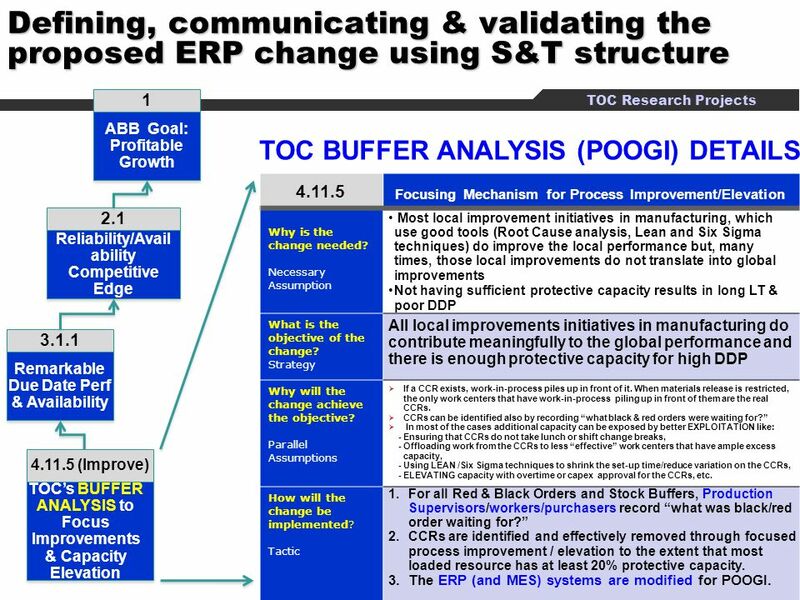 The ERP (and MES) systems are modified for POOGI. 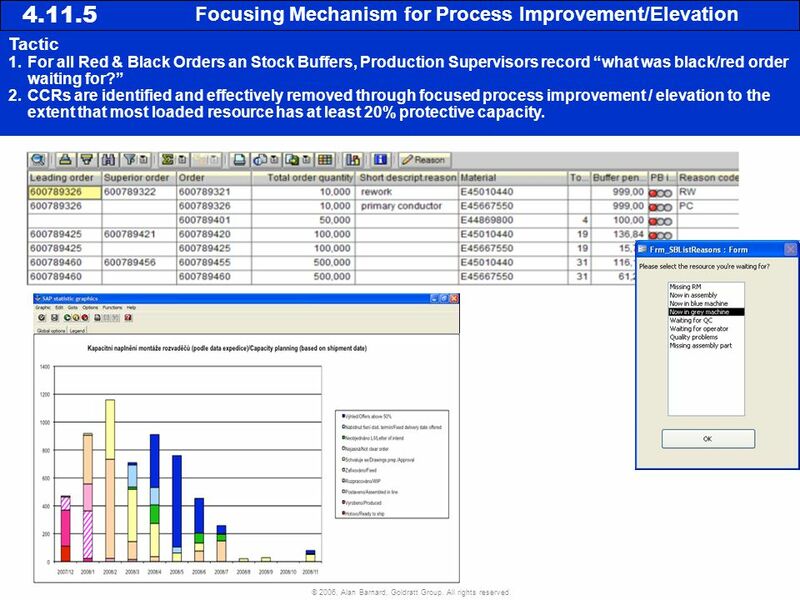 For all Red & Black Orders an Stock Buffers, Production Supervisors record “what was black/red order waiting for?” CCRs are identified and effectively removed through focused process improvement / elevation to the extent that most loaded resource has at least 20% protective capacity. 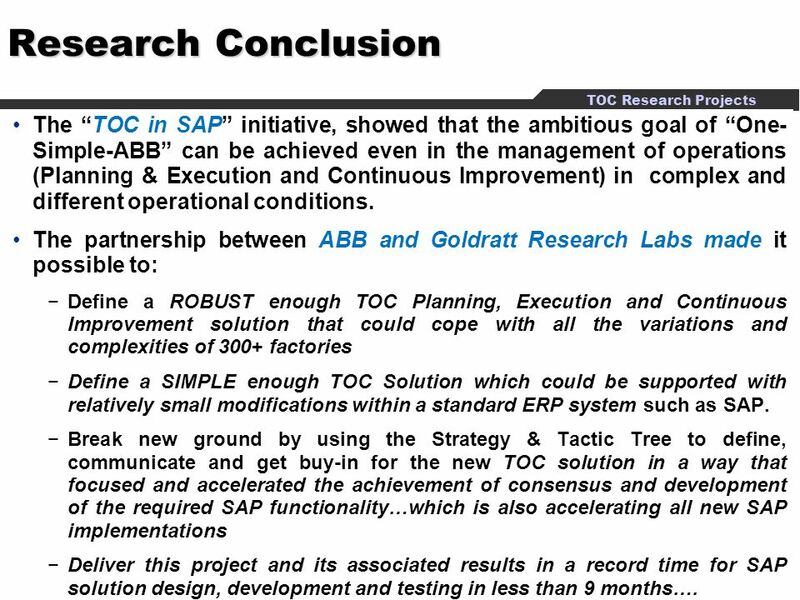 45 Research Conclusion The “TOC in SAP” initiative, showed that the ambitious goal of “One-Simple-ABB” can be achieved even in the management of operations (Planning & Execution and Continuous Improvement) in complex and different operational conditions. 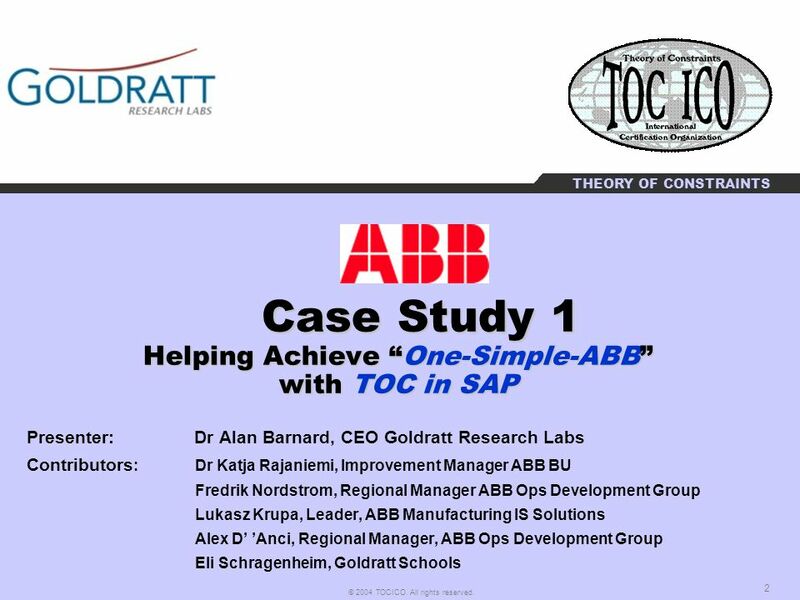 The partnership between ABB and Goldratt Research Labs made it possible to: Define a ROBUST enough TOC Planning, Execution and Continuous Improvement solution that could cope with all the variations and complexities of 300+ factories Define a SIMPLE enough TOC Solution which could be supported with relatively small modifications within a standard ERP system such as SAP. 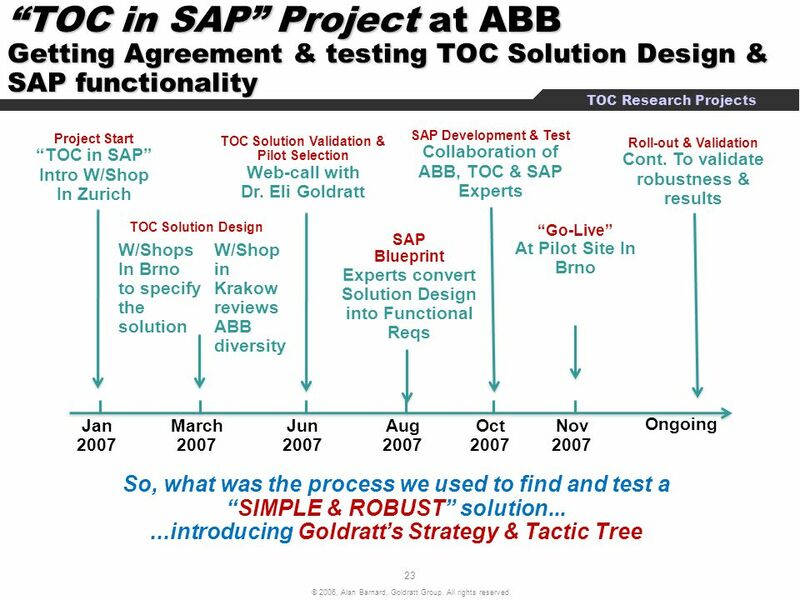 Break new ground by using the Strategy & Tactic Tree to define, communicate and get buy-in for the new TOC solution in a way that focused and accelerated the achievement of consensus and development of the required SAP functionality…which is also accelerating all new SAP implementations Deliver this project and its associated results in a record time for SAP solution design, development and testing in less than 9 months…. 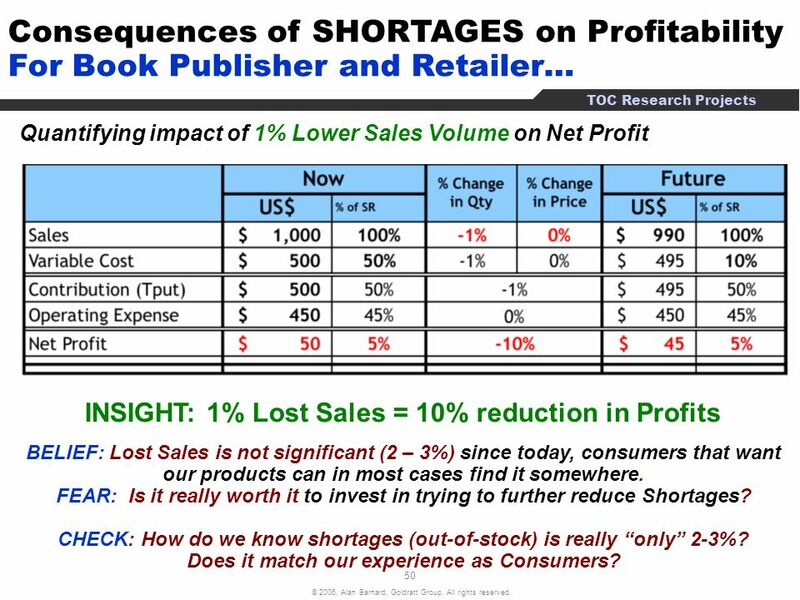 For Book Publisher and Retailer… Quantifying impact of 1% Lower Sales Volume on Net Profit INSIGHT: 1% Lost Sales = 10% reduction in Profits BELIEF: Lost Sales is not significant (2 – 3%) since today, consumers that want our products can in most cases find it somewhere. FEAR: Is it really worth it to invest in trying to further reduce Shortages? 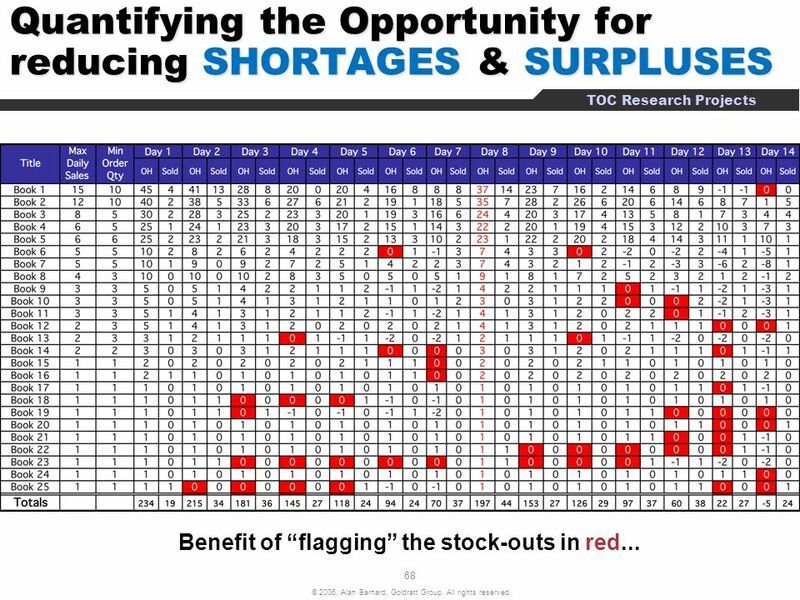 CHECK: How do we know shortages (out-of-stock) is really “only” 2-3%? Does it match our experience as Consumers? 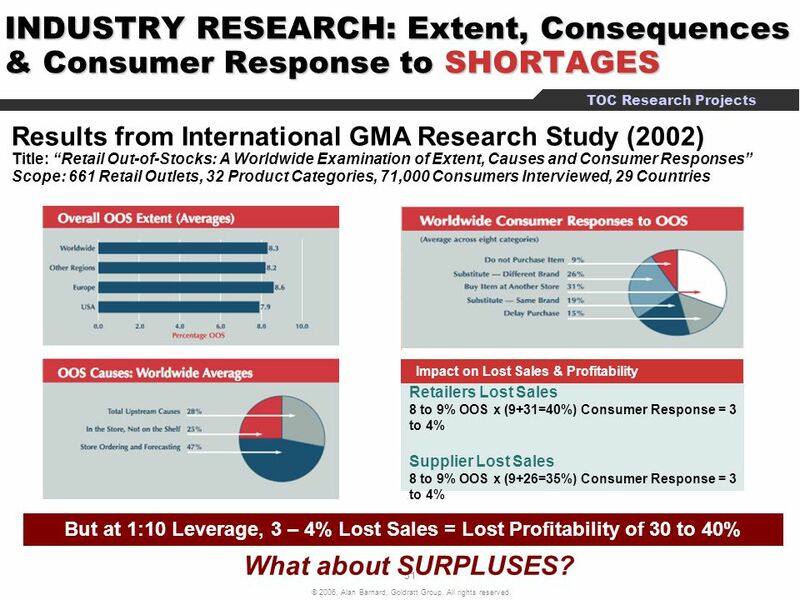 Results from International GMA Research Study (2002) Title: “Retail Out-of-Stocks: A Worldwide Examination of Extent, Causes and Consumer Responses” Scope: 661 Retail Outlets, 32 Product Categories, 71,000 Consumers Interviewed, 29 Countries Impact on Lost Sales & Profitability Retailers Lost Sales 8 to 9% OOS x (9+31=40%) Consumer Response = 3 to 4% Supplier Lost Sales 8 to 9% OOS x (9+26=35%) Consumer Response = 3 to 4% But at 1:10 Leverage, 3 – 4% Lost Sales = Lost Profitability of 30 to 40% What about SURPLUSES? 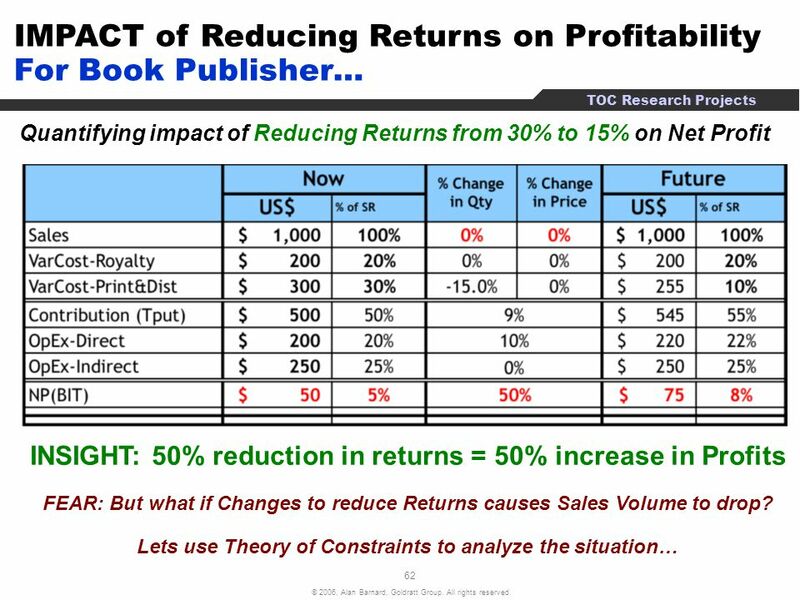 For Book Publisher and Retailer… Quantifying impact of 1% Discount (Lower Price) on Net Profit INSIGHT: 1% Discount in Price = 20% reduction in Profits BELIEF: Consumers are VERY sensitive to pricing...and discounts is necessary since lower prices = more sales FEAR: Reducing discount / increase in price WILL reduce sales much more CHECK: Are consumers REALLY that sensitive to Price? 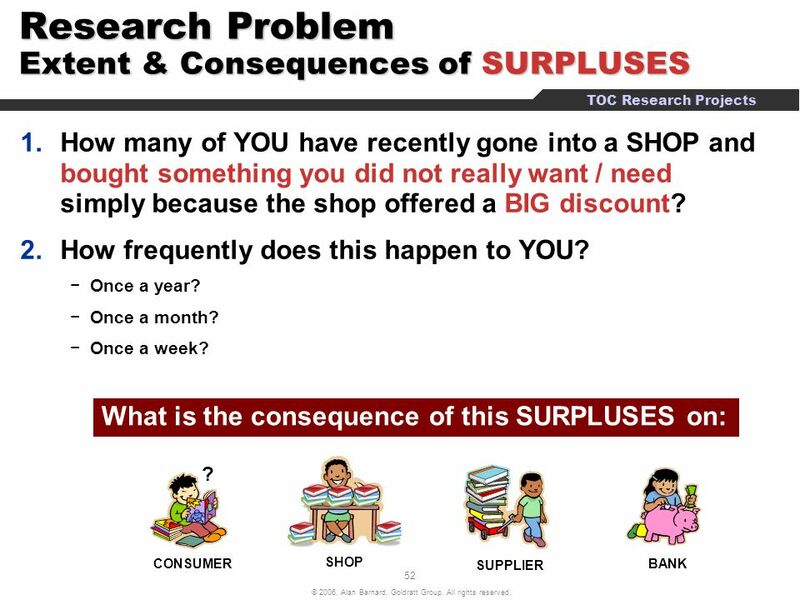 Is it not possible to significantly reduce SURPLUSES (that lead to discounts)? 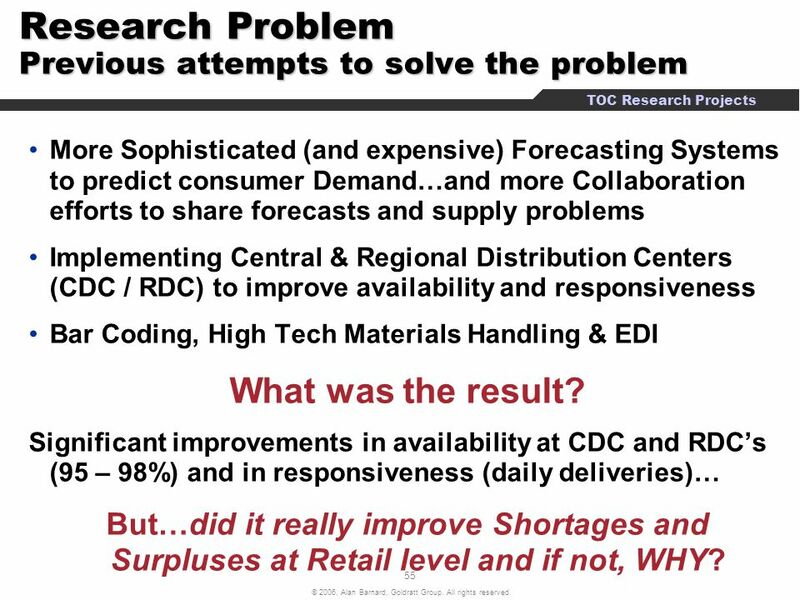 More Sophisticated (and expensive) Forecasting Systems to predict consumer Demand…and more Collaboration efforts to share forecasts and supply problems Implementing Central & Regional Distribution Centers (CDC / RDC) to improve availability and responsiveness Bar Coding, High Tech Materials Handling & EDI What was the result? 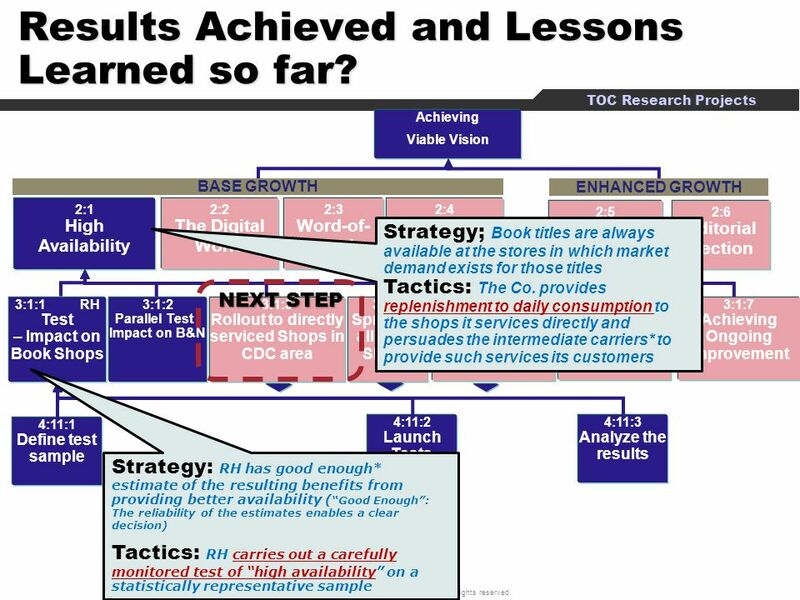 Significant improvements in availability at CDC and RDC’s (95 – 98%) and in responsiveness (daily deliveries)… But…did it really improve Shortages and Surpluses at Retail level and if not, WHY? 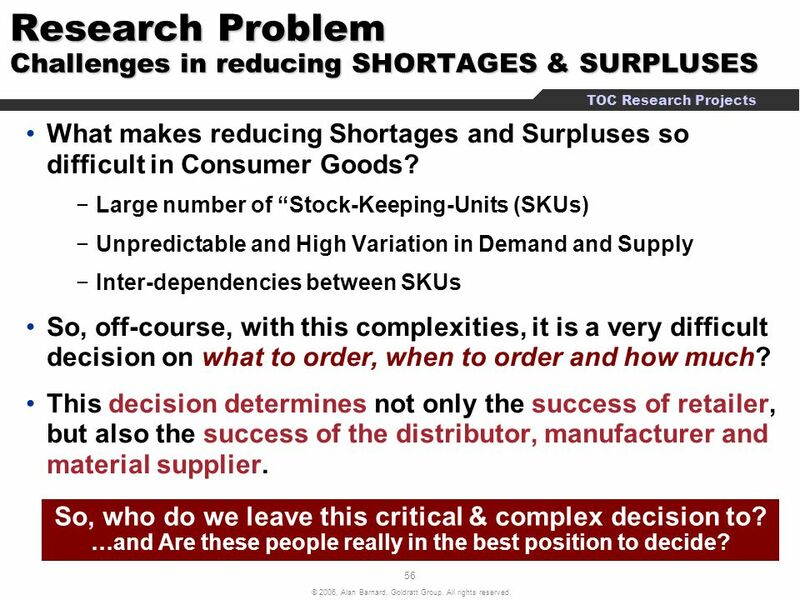 What makes reducing Shortages and Surpluses so difficult in Consumer Goods? 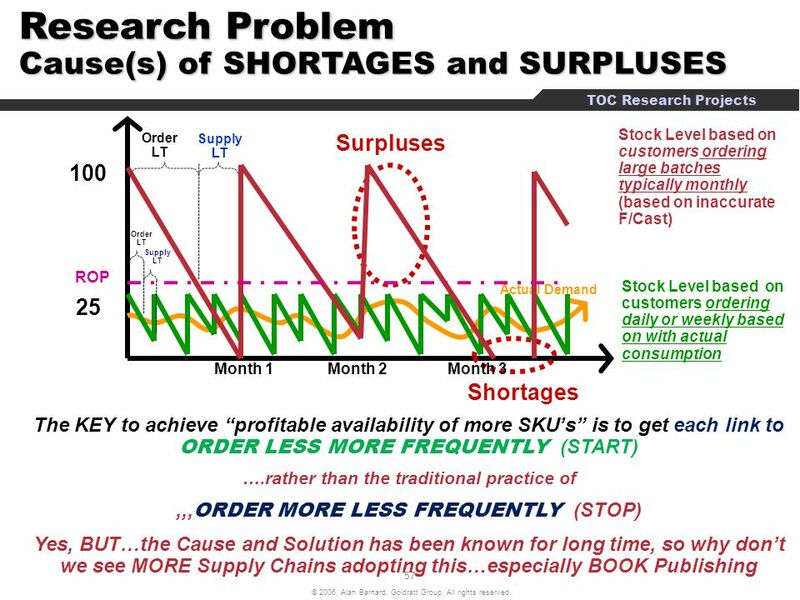 Large number of “Stock-Keeping-Units (SKUs) Unpredictable and High Variation in Demand and Supply Inter-dependencies between SKUs So, off-course, with this complexities, it is a very difficult decision on what to order, when to order and how much? This decision determines not only the success of retailer, but also the success of the distributor, manufacturer and material supplier. So, who do we leave this critical & complex decision to? …and Are these people really in the best position to decide? 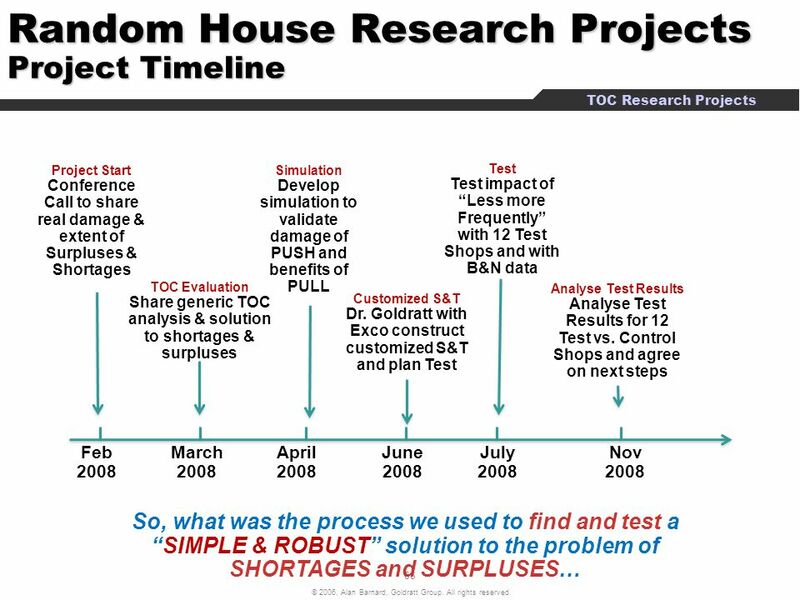 In February 2008, Goldratt Research Labs was approached by Random House Publishing. They are considered one of the best in managing returns, and still have 28% of every book printed returned to be shredded. 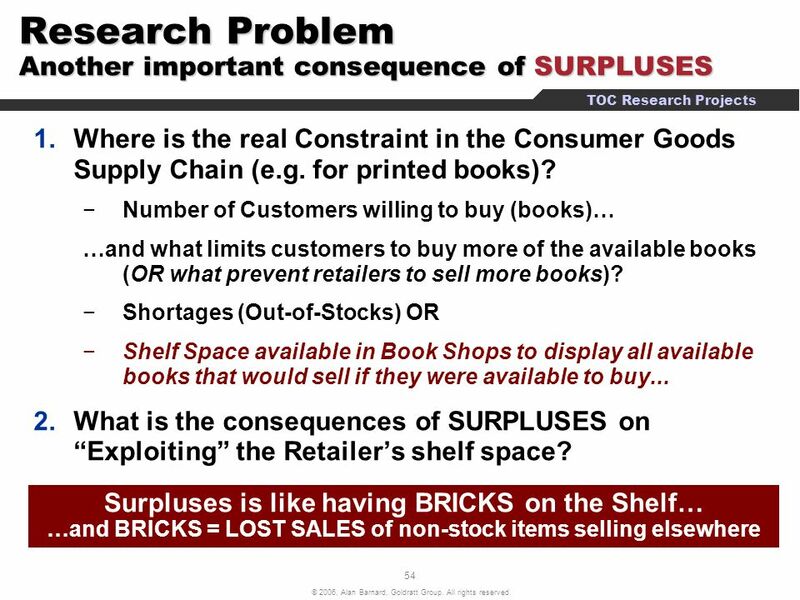 There were no reliable data about the level of surpluses (and or shortages within retailers), and it appeared as if the consequences of these were not fully understood. 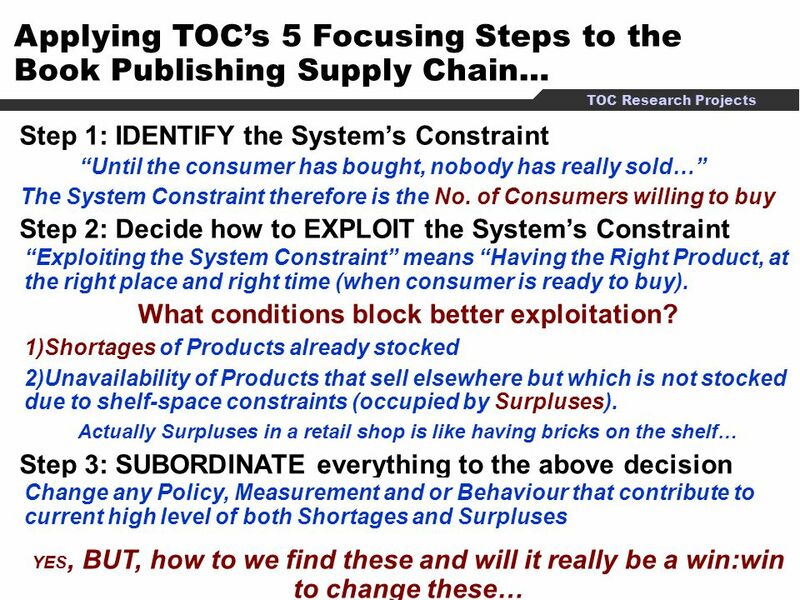 Could Theory of Constraints help to quantify the extent, consequences and causes of the problem… and help to find a solution? The Pressure to improve…. 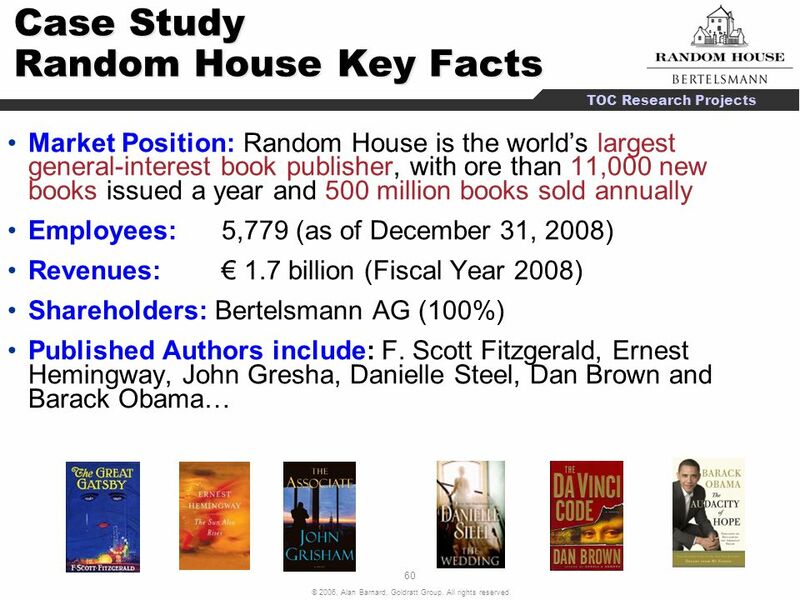 Random House Income Statement in € millions Revenues 1,721 1,837 1,947 1,828 1,791 Operating EBIT EBIT % of Sales	8.0%	9.4%	9.3%	9.1%	7.8% Employees (in absolute numbers) 5,779 5,764 5,804 5,395 5,383 What would be the impact of a significant reduction in Surpluses on profitability …? Is it possible to reduce returns without reducing sales? 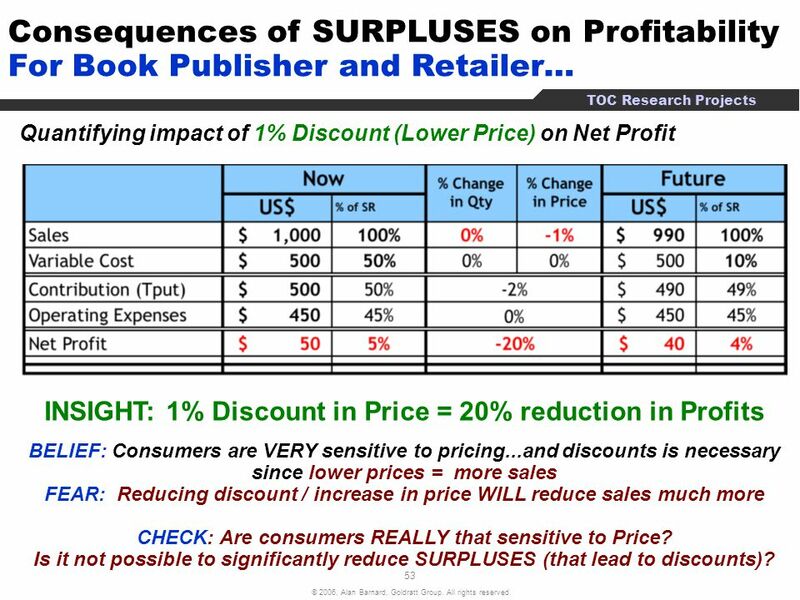 Is “High Returns” the only “cost” of surpluses at retail level? 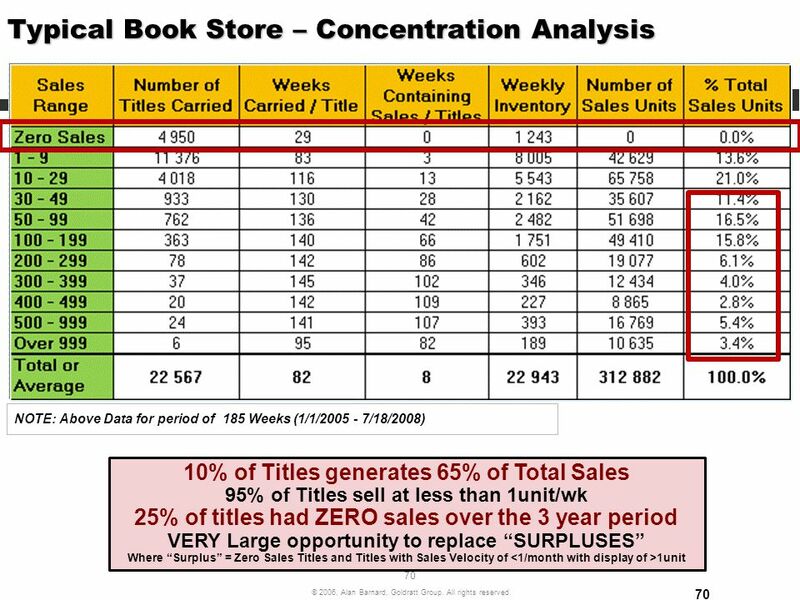 What is the “real level” of unavailability (shortages) of books at retail level? Is it possible to do much better…? 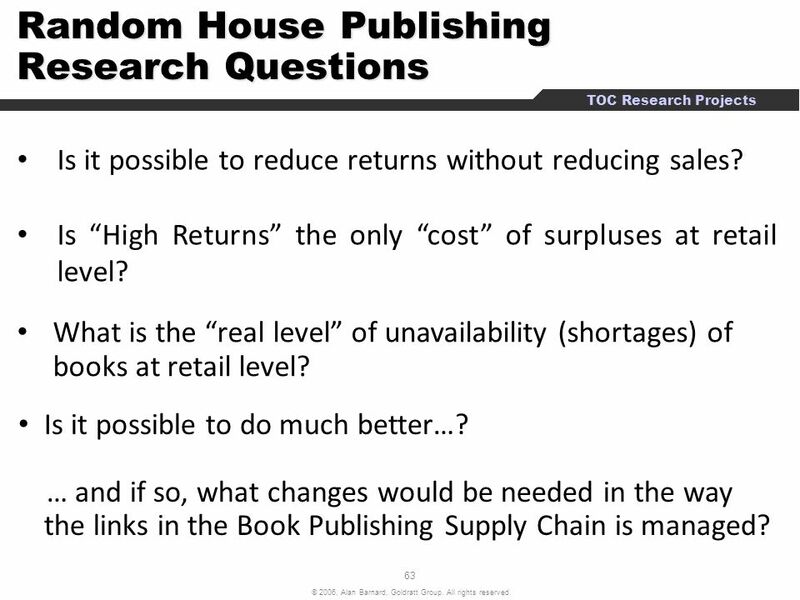 … and if so, what changes would be needed in the way the links in the Book Publishing Supply Chain is managed? 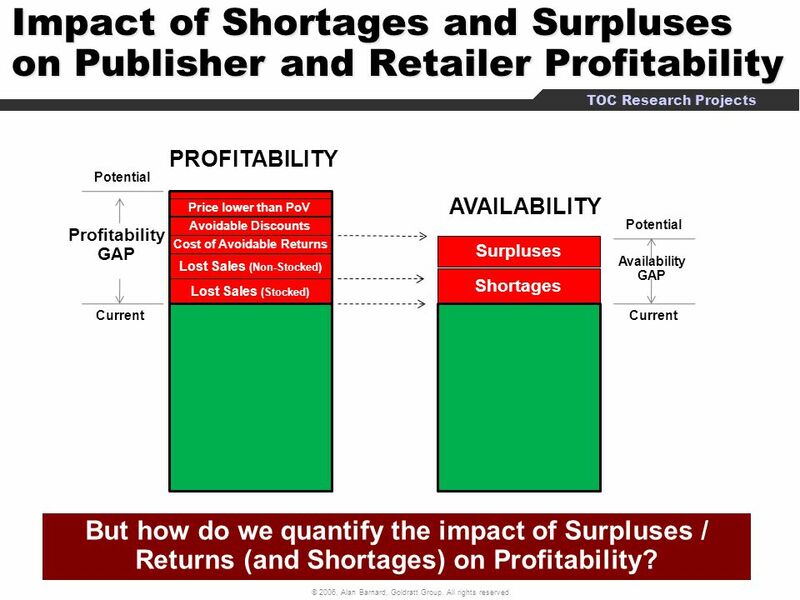 Impact of Shortages and Surpluses on Publisher and Retailer Profitability PROFITABILITY Potential AVAILABILITY Price lower than PoV Avoidable Discounts Potential Profitability GAP Cost of Avoidable Returns Surpluses Lost Sales (Non-Stocked) Availability GAP Shortages Lost Sales (Stocked) Current Current But how do we quantify the impact of Surpluses / Returns (and Shortages) on Profitability? 65 What conditions block better exploitation? 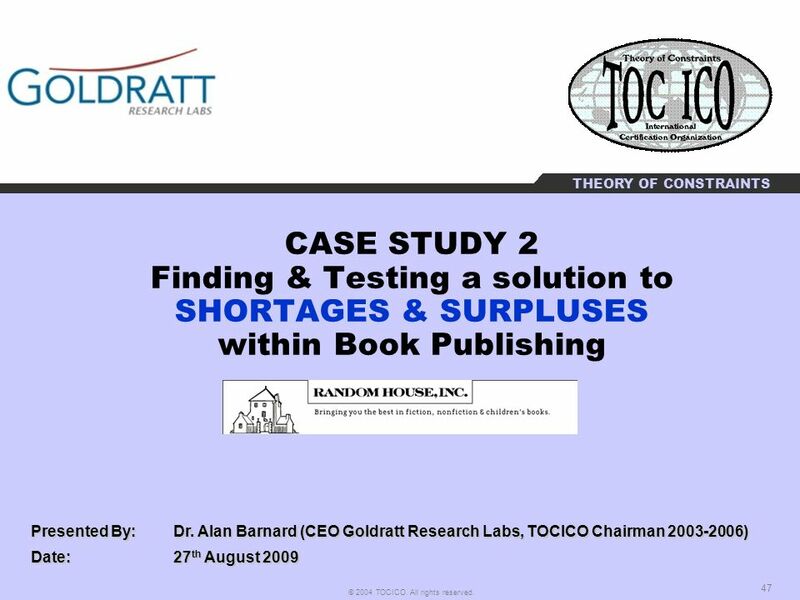 Case Study Book Publishing Research Challenge #1 What makes quantifying the Extent, Consequences and Causes of Surpluses & Shortages so difficult? 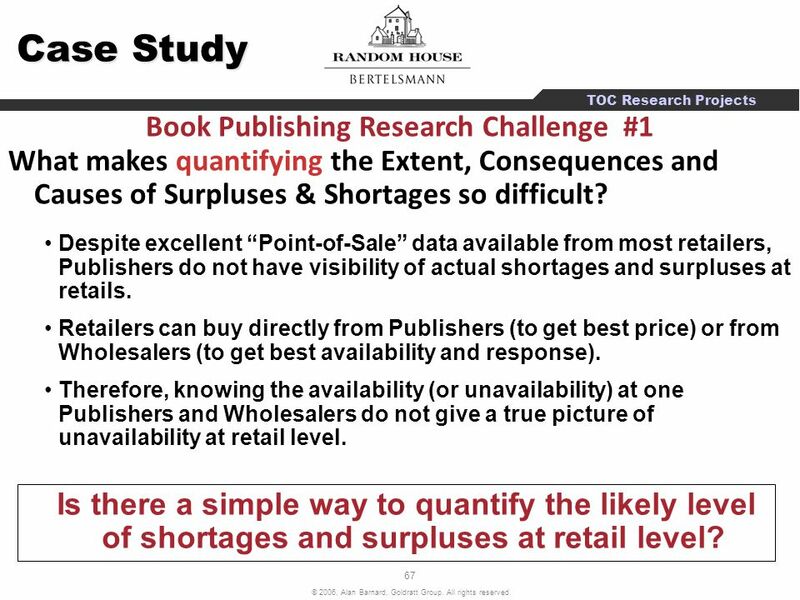 Despite excellent “Point-of-Sale” data available from most retailers, Publishers do not have visibility of actual shortages and surpluses at retails. 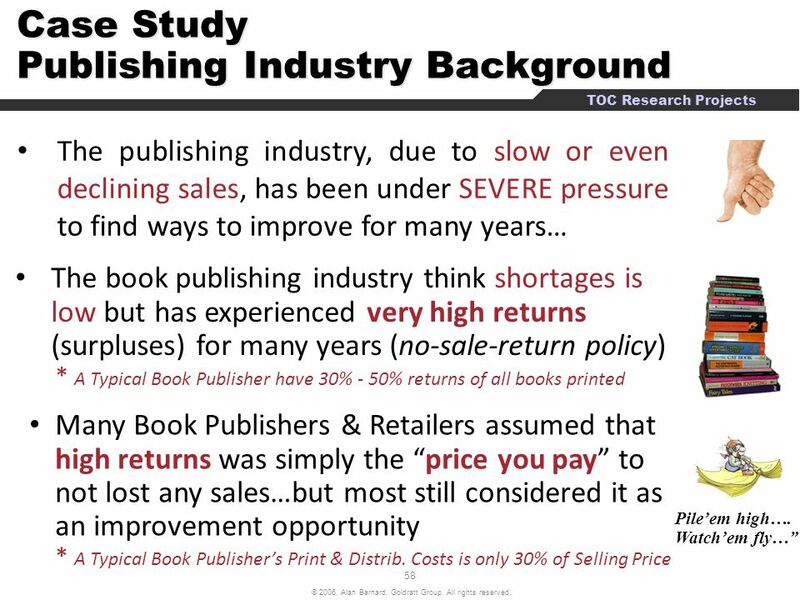 Retailers can buy directly from Publishers (to get best price) or from Wholesalers (to get best availability and response). Therefore, knowing the availability (or unavailability) at one Publishers and Wholesalers do not give a true picture of unavailability at retail level. 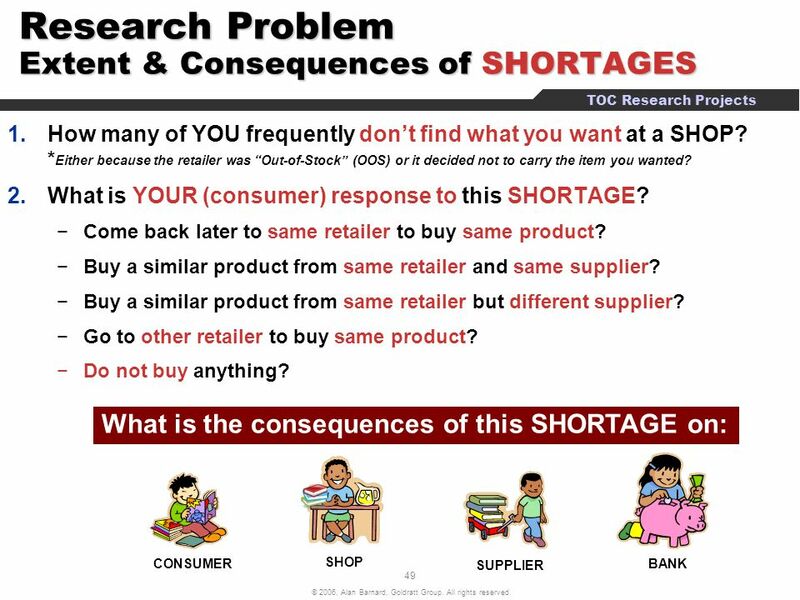 Is there a simple way to quantify the likely level of shortages and surpluses at retail level? 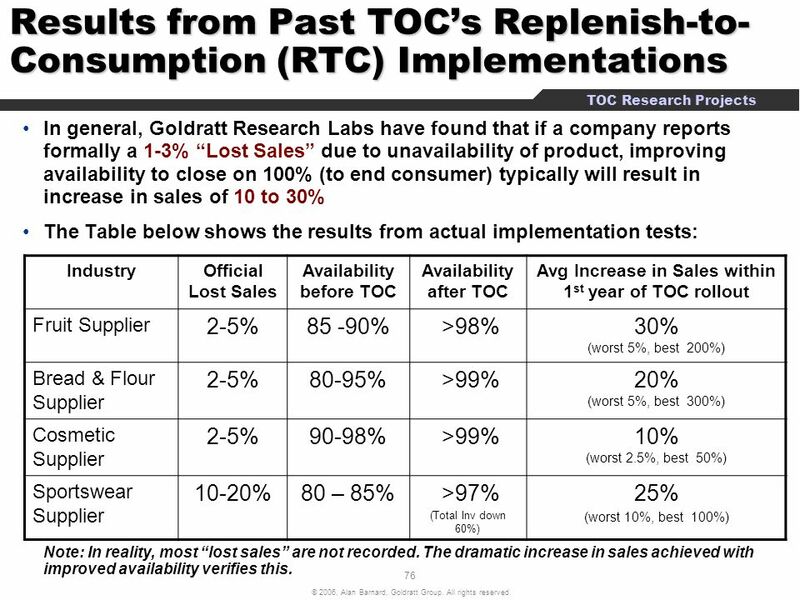 In general, Goldratt Research Labs have found that if a company reports formally a 1-3% “Lost Sales” due to unavailability of product, improving availability to close on 100% (to end consumer) typically will result in increase in sales of 10 to 30% The Table below shows the results from actual implementation tests: Industry Official Lost Sales Availability before TOC Availability after TOC Avg Increase in Sales within 1st year of TOC rollout Fruit Supplier 2-5% 85 -90% >98% 30% (worst 5%, best 200%) Bread & Flour Supplier 80-95% >99% 20% (worst 5%, best 300%) Cosmetic Supplier 90-98% 10% (worst 2.5%, best 50%) Sportswear Supplier 10-20% 80 – 85% >97% (Total Inv down 60%) 25% (worst 10%, best 100%) Note: In reality, most “lost sales” are not recorded. 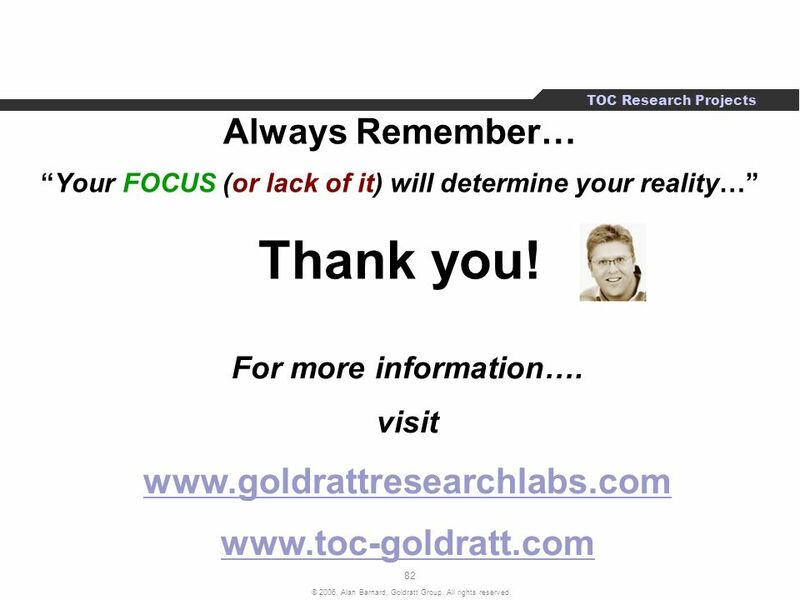 The dramatic increase in sales achieved with improved availability verifies this. Research Questions: 1. Acceptance Rate? 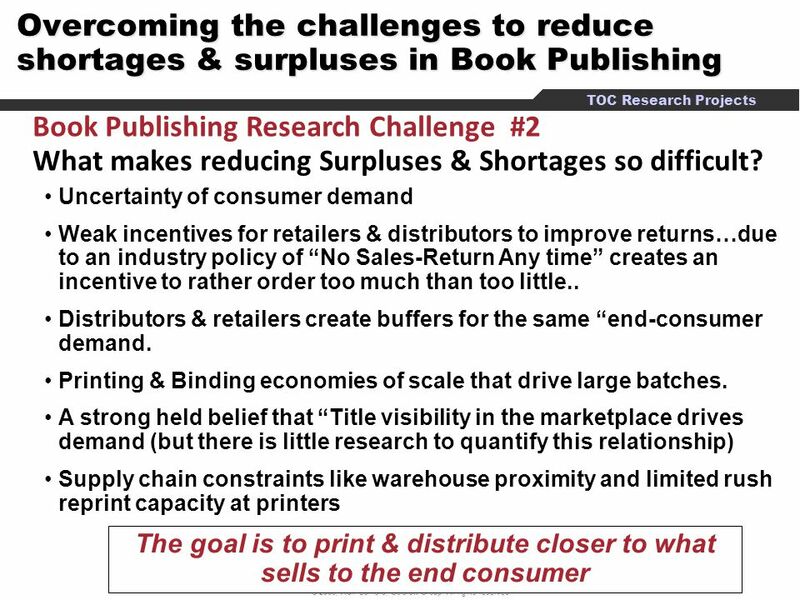 % of Shops accepting the offer for the Publisher to “Replenish Daily on Actual Consumption 2. Difficulty to setup up RTC system? 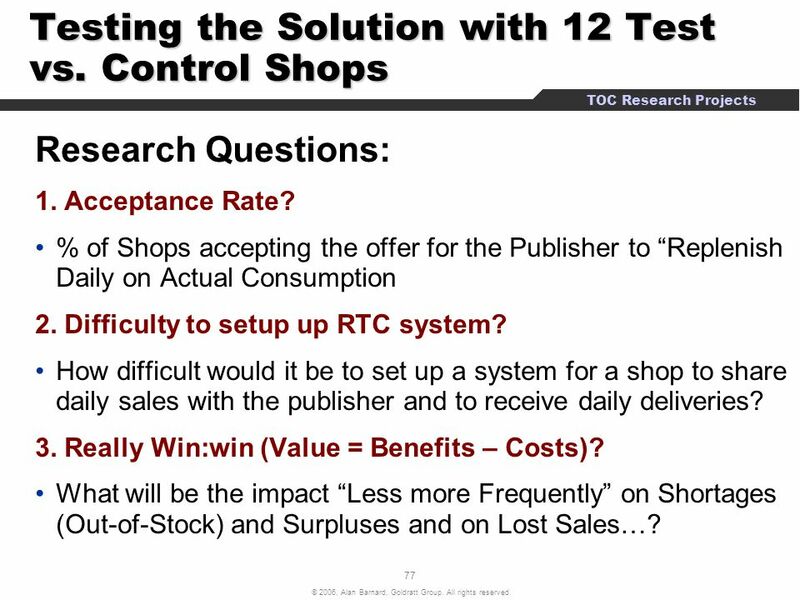 How difficult would it be to set up a system for a shop to share daily sales with the publisher and to receive daily deliveries? 3. Really Win:win (Value = Benefits – Costs)? 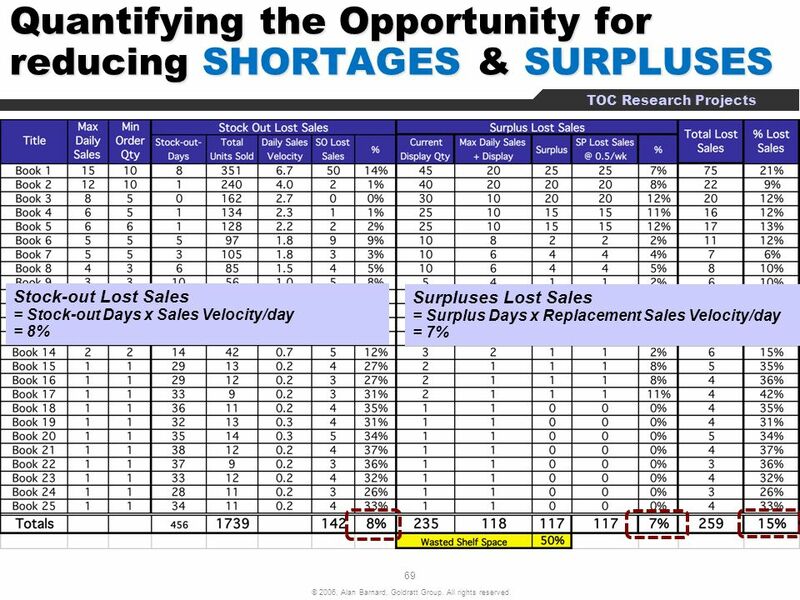 What will be the impact “Less more Frequently” on Shortages (Out-of-Stock) and Surpluses and on Lost Sales…? 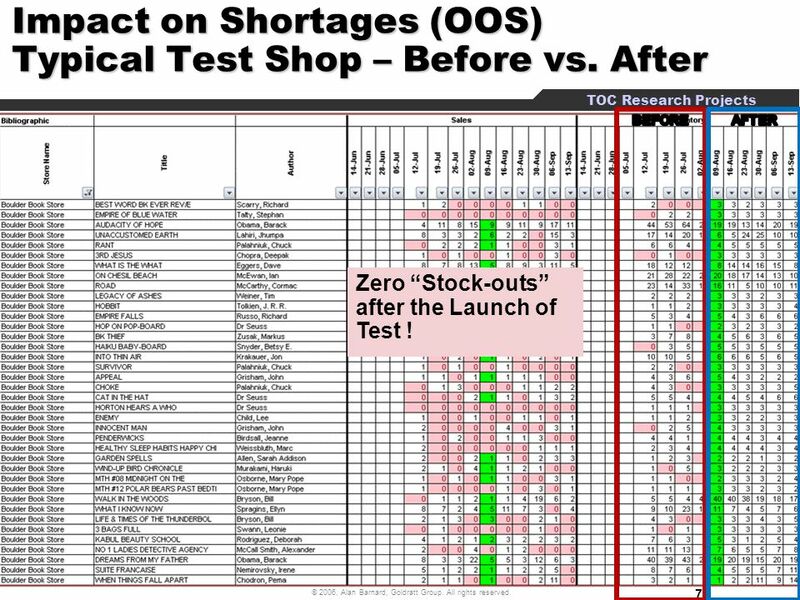 Zero “Stock-outs” after the Launch of Test ! 80 Results Achieved and Lessons Learned so far? 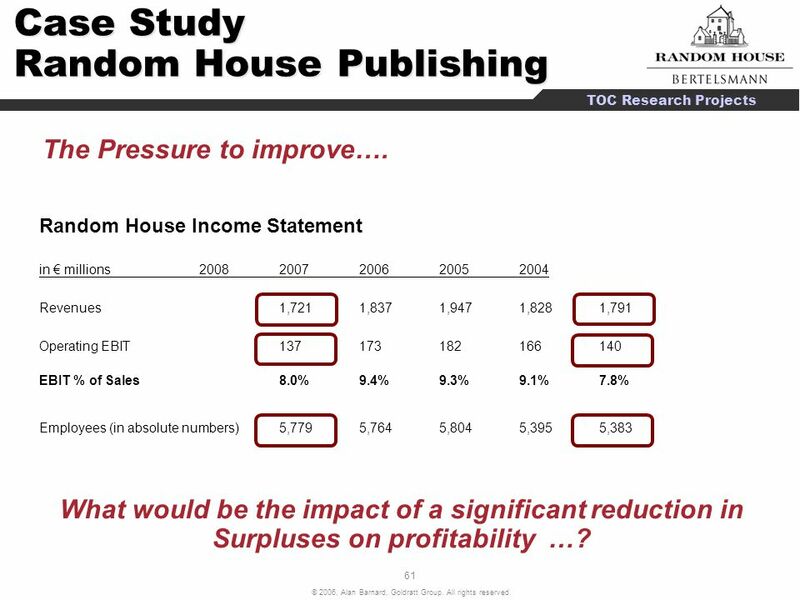 Importance of knowing how to answer simple question of “By how much has Sales gone up?” due to this change... Very high level of acceptance rate of offer to replenish daily based on actual sales (>80%) “Replenishing Daily on Actual Consumption” can help significantly reduce Shortages & Surpluse: Sales Increase by preventing Shortages around % Sales increase by replacing Surpluses (if done on wide enough scale) can be 5-20%. 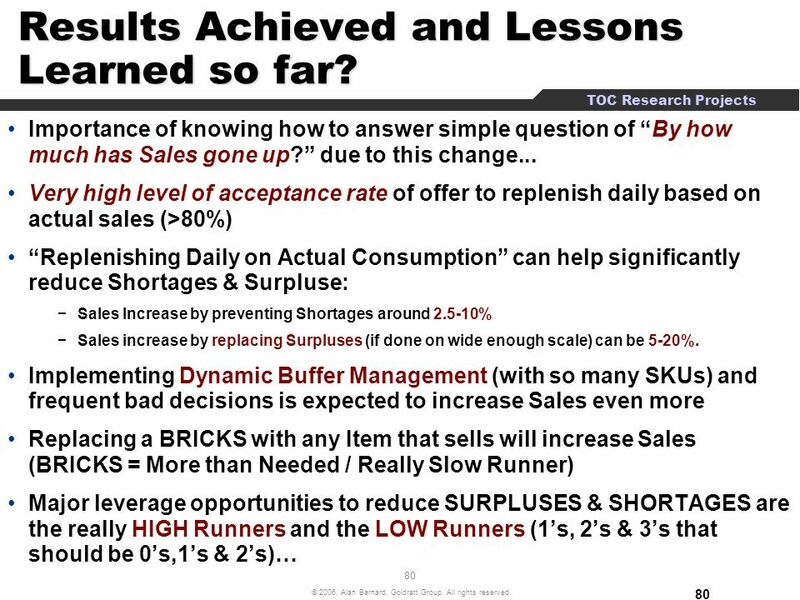 Implementing Dynamic Buffer Management (with so many SKUs) and frequent bad decisions is expected to increase Sales even more Replacing a BRICKS with any Item that sells will increase Sales (BRICKS = More than Needed / Really Slow Runner) Major leverage opportunities to reduce SURPLUSES & SHORTAGES are the really HIGH Runners and the LOW Runners (1’s, 2’s & 3’s that should be 0’s,1’s & 2’s)… What is the chances on a specific day that a book selling at 1/month will be sold 1/30 = 0.03 What is the chances that on a specific day we will sell TWO books, is 0.03 x 0.03 = What SURPLUSES must be replaced? - Anything for which shop carries more than 1 unit which is NOT on a formal DISPLAY promotion that sell less than 1/month. Eli said he is disappointed RH team did not attend Realization conference where company after company (similar in size) was showing what results is possible on a company level within just 12 months. 81 Results Achieved and Lessons Learned so far? 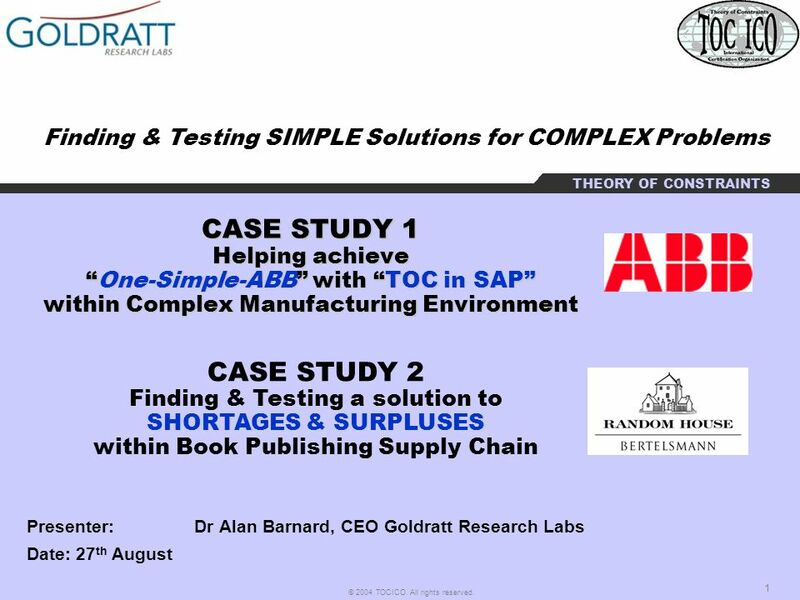 Download ppt "Finding & Testing SIMPLE Solutions for COMPLEX Problems"
Symphony Technology Group and IBS Bookmaster Pallab Chatterjee, IBS Executive Chairman. MEETING THE DEMANDS OF AN ON DEMAND WORLD. Collaborative Business Management CRM S&OP DEMAND MANAGEMENT INTEGRATION. Fergal Carton / AFIS MBA 642 / BIS Foundation. Fergal Carton / AFIS MBA 642 / BIS Foundation DELL Direct model Price for Performance –No resellers, retailers. 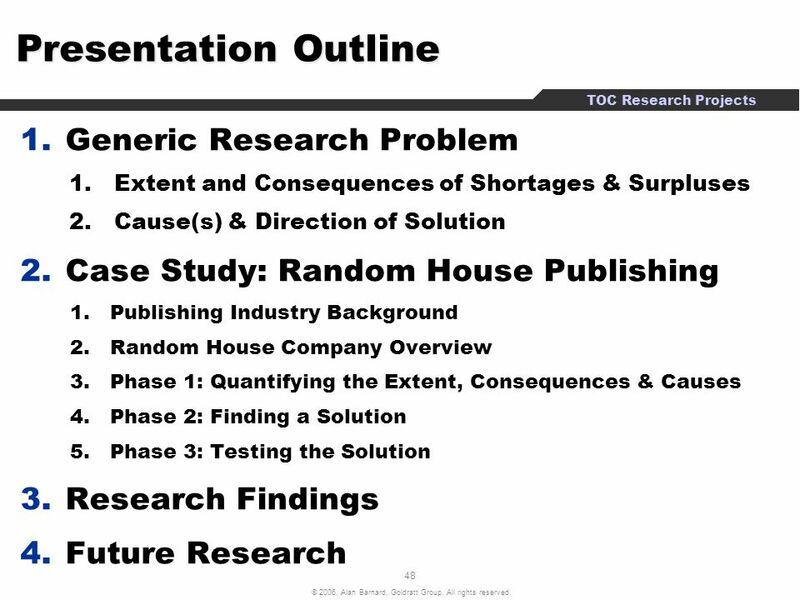 1 Chapter 3 Organizing The Purchasing Function IDIS 424 Spring 2004. Advanced Manufacturing Laboratory Department of Industrial Engineering Sharif University of Technology Session #8.